O edifício da sede da EDP, do atelier Aires Mateus, e o novo Terminal de Cruzeiros de Lisboa, de João Luís Carrilho da Graça Arquitectos, projectos fotografados por Fernando Guerra, são os vencedores do Prémio Valmor e Municipal de Arquitectura 2017. Por outro lado, das quatro menções honrosas atribuídas no âmbito desta distinção promovida pela Câmara de Lisboa e pela Trienal de Arquitectura, duas são de projectos igualmente presentes no nosso portefólio fotográfico: a recuperação do Palacete de Santa Catarina, de Teresa Nunes da Ponte, Arquitectura, e a recuperação do Largo de Santos e vias adjacentes, projectos da autoria do atelier 92 Arquitectos, de João Almeida e Luís Torgal, e do arquitecto paisagista Victor Beiramar Diniz. O júri da edição de 2017 do Prémio Valmor e Municipal de Arquitectura foi constituído por Catarina Vaz Pinto, Vereadora da Cultura da Câmara Municipal de Lisboa, por Jorge Catarino Tavares, Director Municipal de Urbanismo e pelos arquitectos Alberto Souza Oliveira, personalidade convidada pelo Presidente da Câmara Municipal de Lisboa, Francisco Berger, representante da Academia Nacional de Belas-Artes, Cândido Chuva Gomes, representante da Ordem dos Arquitectos e João Pardal Monteiro, representante da Faculdade de Arquitectura da Universidade de Lisboa. Entre os dias 12 e 30 de abril de 2019, o Centro de Informação Urbana de Lisboa, localizado no Piso 1 do Picoas Plaza, terá patente uma exposição dedicada aos seis projectos selecionados. Para visitar de segunda a sexta-feira, das 10h às 20h. A entrada é livre. 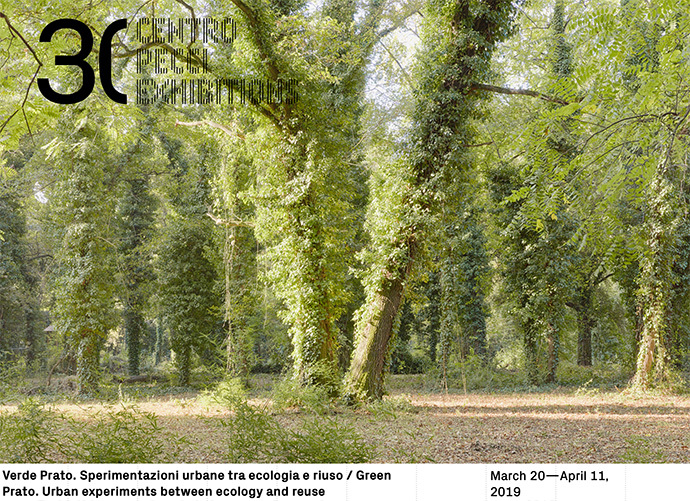 URBAN EXPERIMENTS BETWEEN ECOLOGY AND REUSE. Fernando Guerra (Lisboa, 1970) has been a pioneer in the way architecture is photographed and divulged. 20 years ago, he opened studio FG+SG together with his brother, and both are responsible in large part for the diffusion of Portuguese contemporary architecture in the last twenty years. Fernando Guerra is an architectural photographer. His training, however, is as an architect. His gaze is divided between two distinct modes of constructing the world. 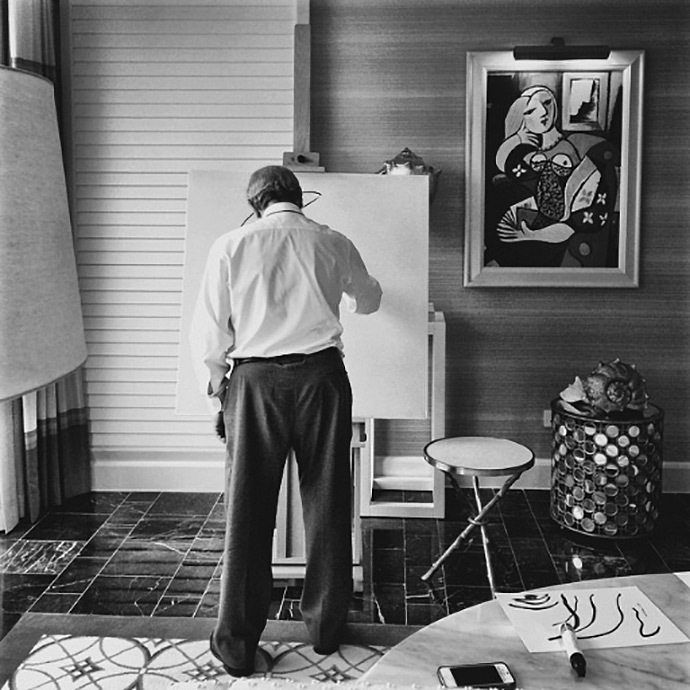 Given this fact, he is in a prime position to personify the metamorphosis of the field of photography that will lead the practice of creating images to eventually identify itself, in part, with the field of architecture. Fernando Guerra's work is regularly published in various national and international publications, in magazines such as Casabella, Wallpaper*, Dwell, Icon, Domus, A+U, among many others. 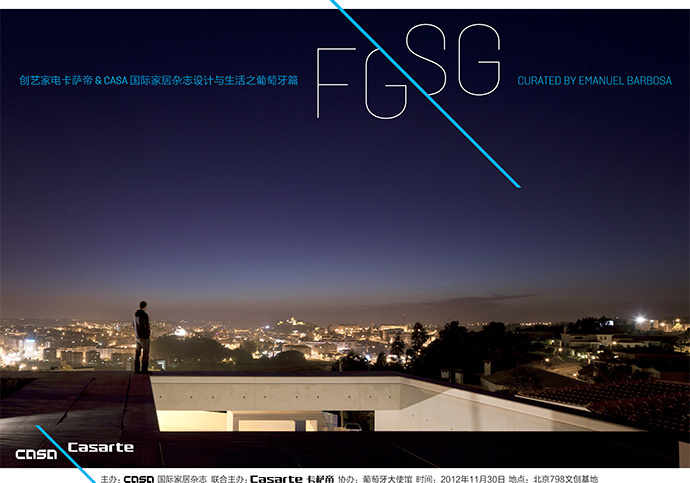 FG+SG collaborates with various Portuguese architects such as Álvaro Siza, Carlos Castanheira, Manuel Mateus, Manuel Graça Dias, Gonçalo Byrne, ARX Portugal, João Luís Carrilho da Graça, Promontório Arquitectos, as well as international architects such as Márcio Kogan, Isay Weifeld, Arthur Casas, Zaha Hadid, Pei Cobb Freed & Partners, among others. In 2012 he was nominated Canon Explorer, having been appointed Canon Explorer, assuming the role of ambassador for Canon Europe in terms of architectural photography. Music of the Documentary "The Flying Photographer"
Three decades ago, the explosion of the Space Shuttle Challenger was one of the biggest stories of the year. But that year also saw the fall of President Ferdinand Marcos, the passing by of Halley’s Comet, the crash of Aeromexico flight 498 above Los Angeles and, of course, the Chernobyl accident. In Portugal, far away from almost everything, we had the most divisive presidential election ever, and we finally joined the European Community. To be honest, for me at the age of 16, the challenge was to avoid pimples on my face and to begin the next-to-last year of school before entering university to study architecture. It was during that endless 1986 summer vacation, in early July, that something came to change my life forever: I got my first camera and that's where it all started. The journey began with a recently released Canon T90. It was the camera I had chosen. Maybe I was attracted to its design, since I understood very little about photography and there are simpler cameras to start with than that one, never stoped me. From that moment on, it was rare to leave the house without a camera, together with two or three rolls of film. It was without understanding very well what I wanted to do that I would do it. The internet did not exist and my only resources were the indispensable magazines that were available. And of course, a great deal of perseverance. To learn from one’s mistakes... A still very contemporary way to learn what you don’t know, but sometimes easily forgotten. Dozens of cameras and lenses later, many of which still keep me company as a testimony to their important role in the images I have created during my life, like they are a journey’s milestones but today, September 5th, I am in Perpignan, France, to tell you about the till now very secret Canon mirrorless, in my role as a brand ambassador. I will exhaustively test the camera on my various assignments that start in just a few days on the other side of the Atlantic. Already have my own EOS R and it’s time to rock! The journey from the adolescent who persuades his parents to buy the most sophisticated camera on the market to becoming a brand ambassador has been special. Perhaps because it was my own journey and perhaps also because it was not outlined in advance. It just happened. The enthusiasm of having a new camera is still as great as it was 30 years ago and the fact that I am one of the first people to use it is a unique opportunity shared only by my fellow ambassadors around the world. And, of course, by my friend Joel Santos. It has been special to be part of the Canon team for some years now. I took part in the launch of the canon 5DR, a camera that I’ve used daily for the past 4 years and that is the basis of what I do and the images I produce. My public association with brands is restricted to only those that I actually use, and for those who trust my work, my mission is to convey the message of why they are the best, if they really are- and what their advantages are. Currently, 90% of what I shoot is done with one camera and one lens. Just 1. Simple and effective for someone who spend his life on the go. The more that time passes and the more that I take pictures, the less I need loads of equipment with me. A new camera is always an element that can cause as much of a disturbance as it can inspiration. I’ve spent some time with the EOS R and I’m really impressed. I’m heading to South America in a few days for some big projects and this camera will be top of my kit bag for all of my assignments. I can’t wait to see what we can do. Shooting is not a job. It’s a way of life, an obsession to be lived every day of the year. I’ll be sharing my upcoming experiences with the new EOS R here on Instagram and on Canon’s website, and if you have any questions, get in touch. I’m going to test this camera to its limits, it’s going to be fun and I hope you’ll follow along. Thanks for being there with me. 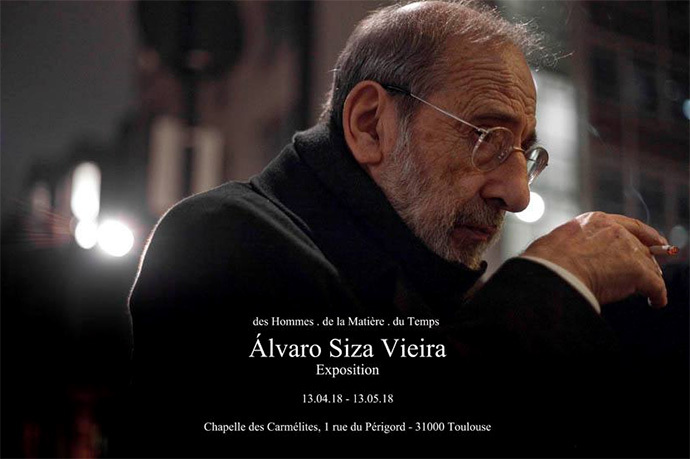 The Association "des Hommes, de la Matière et du Temps" is pleased to present its first exhibition dedicated to the work of the Portuguese architect Álvaro Siza, in the prestigious Carmelite Chapel in Toulouse. A selection of projects, linked to the themes of Living, Rehabilitating etc. 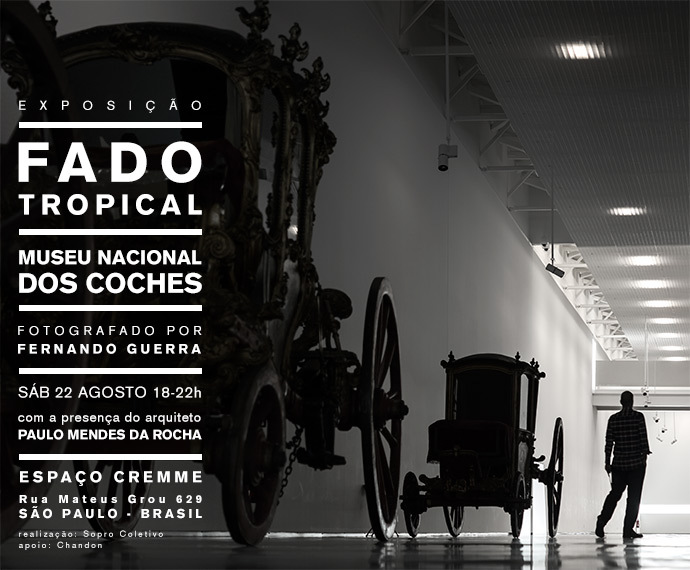 will be exhibited, based on the archives of Álvaro Siza Vieira's studio. The Association, non-profitable, according to the law of 1901, has set itself the goal of disclosing the work of men and women with a masterful relationship between a Matter, Time and Men, foremost among which, the Architecture. 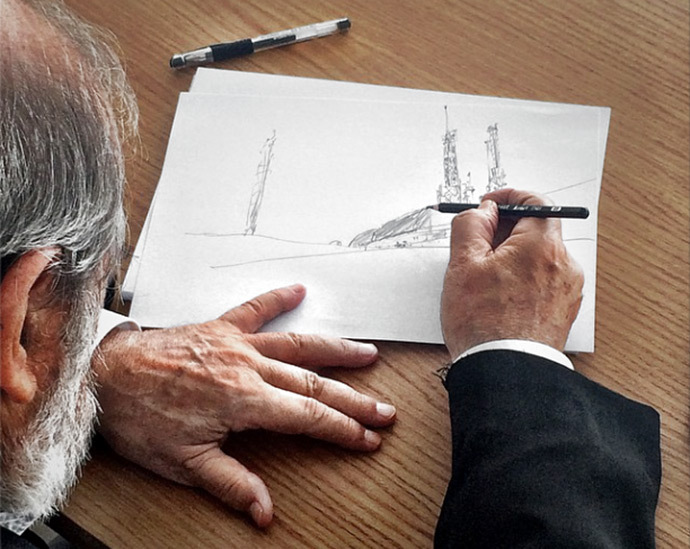 Álvaro Siza was born in 1933 in Matosinhos, near Porto. He began his career as an architect in the studio of his teacher and friend Fernando Tàvora before founding his own agency in Porto. After promising and discreet beginnings that the first international critics report, the reconstruction of Chiado in Lisbon designates him as the greatest architect of his country. Follow numerous and important orders which each time testify to a singular contribution to the international production, quickly recognized by all school of architecture of Porto, Galician center of Contemporary Art of Santiago de Compostela, Pavilion of Portugal at the Universal Exhibition of 1998, Church of Marco de Canaveses, Museum of the Serralves Foundation, etc. He also builds abroad, Netherlands, Germany, Spain, Belgium, Italy, Brazil, South Korea, France. He received the Pritzker Prize in 1992 and the Golden Lion of Venice in 2002. The Chapel of the Carmelites: Only remnant of the convent of the Carmelites, destroyed during the Revolution. Built in the seventeenth century and decorated in the eighteenth century, the Chapel is notable for its baroque architecture, rare in the pink city and impressive wall paintings signed Jean Rivalz. Behind a blind portal, the Chapel protects itself from the street by a courtyard, paved with pebbles of rivers. The few steps separating us from the main space allow us to discover it on a low-angle view. The light, rare and precious, ricochets on the gilding of its decorations for more than three centuries. This frame, as mysterious as it is voicing, is the one in which the first chapter of our movement is written. 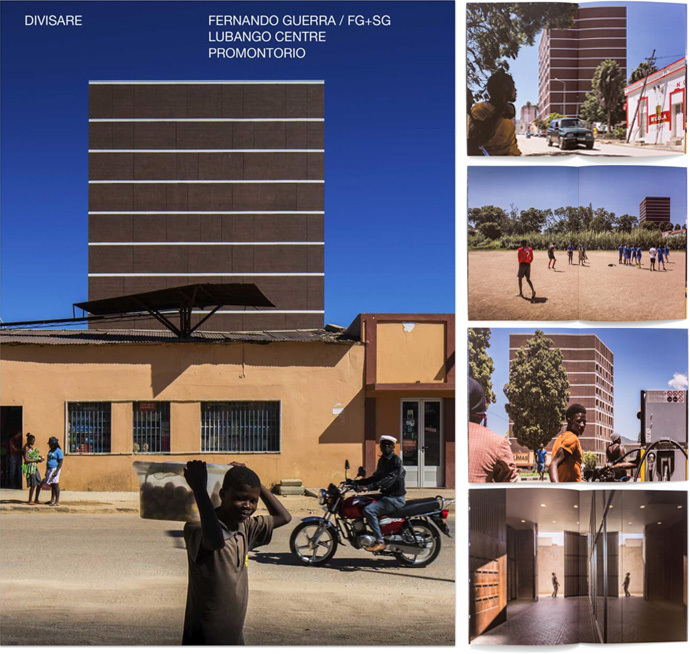 Issue #181 presents the visual narration by Fernando Guerra of an apartment block designed by Portuguese architectural office Promontorio in Lubango, Angola. Guerra narrates more than a piece of architecture. He explores the relations between the building and the urban contexts, portrait daily life scenes dense of dichotomic beauty. All of our prices include shipping to anywhere in the world. All of our issues are extremely limited editions. Don’t be late! Printed with vegetable inks on 100% recycled Cyclus Offest thick paper. It even smells good. Divisare Books editorial project it’s about switching off and getting away from the screen. That’s why we don’t offer a digital version. Fernando Guerra tem acompanhado a produção arquitetónica contemporânea através da plataforma Últimas Reportagens. A sua prática fotográfica responde à evolução técnica do campo da fotografia nas últimas décadas, marcada essencialmente pela afirmação dos novos meios digitais. A Cidade na ponta dos dedos mostra-lhe um RaioX que apresenta o trabalho autoral de Fernando Guerra atravessado por uma cartografia da atividade do escritório FG+SG. Paulo Martins Barata, partner do atelier de arquitectura Promontório conduz esta grande viagem. Com o novo milénio, a fotografia de arquitectura ganhou uma preponderância exponencial. Respondendo aos desafios da mediatização da arquitectura na contemporaneidade, o escritório FG+SG é hoje uma prática fotográfica estabelecida e premiada internacionalmente. A afirmação progressiva de Fernando Guerra acompanha a produção de arquitectos nacionais e internacionais e revela um conjunto de obras incontornáveis da produção arquitectónica recente. 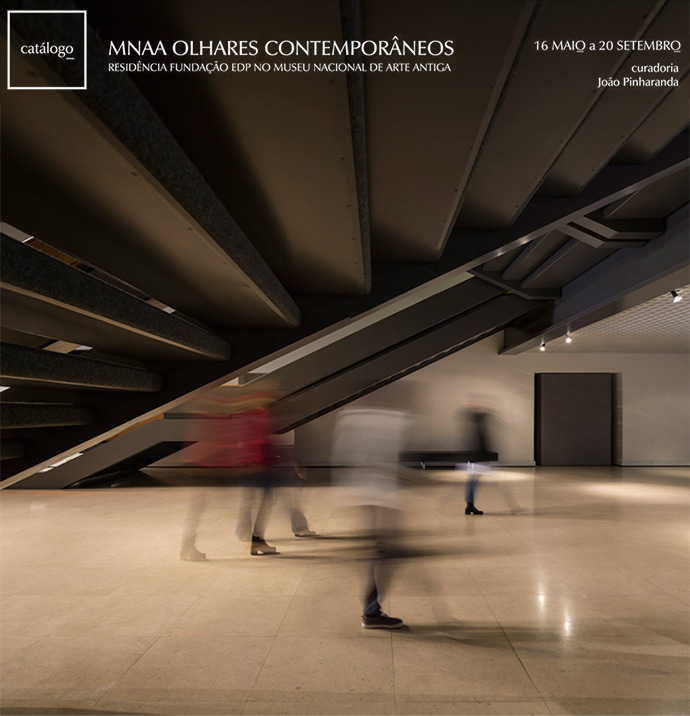 Por outro lado, as suas reportagens fotográficas apresentam um ponto de vista privilegiado sobre a arquitectura portuguesa contemporânea. Entre diferentes arquitectos e diversas geografias, a exposição apresenta o trabalho autoral de Fernando Guerra atravessado por uma cartografia da actividade do escritório FG+SG, convocando o seu arquivo de imagens e evidenciando os seus processos de produção. With the new millennium, architectural photography has gained an exponential preponderance. Responding to the challenges of media coverage of contemporary architecture, FG + SG is now an established and internationally awarded photographic studio. The progressive affirmation of Fernando Guerra has accompanied the output from national and international architects, revealing a set of compelling recent architectural works. 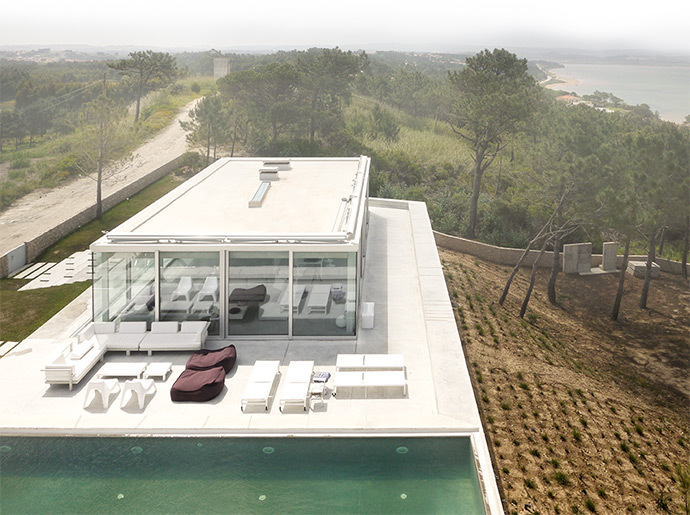 His photographic pieces present a privileged view of contemporary Portuguese architecture as well. Between different architects and multiple geographies, the exhibition presents original work by Fernando Guerra crossed by a map of FG + SG office activity, bringing together his archive of images and revealing his production processes. "As a photographer, says Fernando Guerra, you are the messenger of an object and its architect. He is an interesting man, who sees success as the result of unconditional dedication and regards courage as the willingness to pursue new directions. 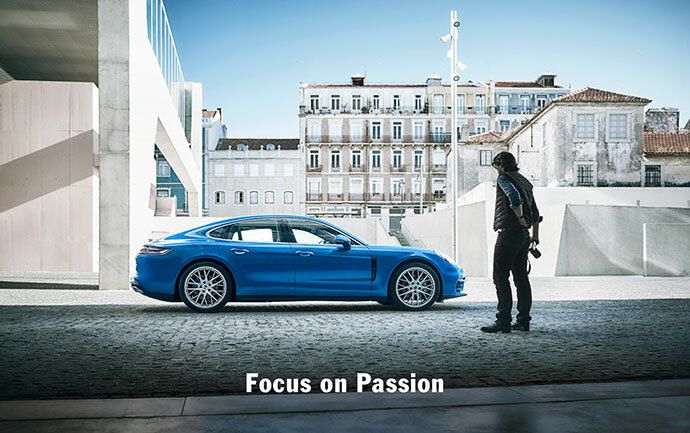 This attitude and his real passion for Porsche left us with no option but to get him to do a photoshoot of the new Panamera. And he did that in his favourite city, Lisbon. We accompanied him and got to see his fascinating work and his home city." "Fernando Guerra was born in Lisbon, Portugal in 1970. In the country of explorers, where the people see themselves as descendants of such explorers and reflect this in their mentality. "It is inherent in us Portuguese to be courageous and make changes", he says, looking out somewhere towards the sea. "We are no longer going to discover India or Brazil. But maybe we'll discover new ways of doing things." A rolling stone gathers no moss. To keep it rolling: get out and do something. Experience things. And work hard." "Having completed his studies in architecture, Guerra left his beloved Portugal and went to work in Macau, where he lived for five years and gained a lot of experience and new impressions. Photography was ever-present in his life - even during his studies, he had a camera in his hand every day. But he knew that he wasn't going to spend the rest of his life in Macau. It wasn't just his yearning for home that he had to cope with, but also a certain 1973 Porsche 911 Targa, which was waiting patiently for him at home in his father's garage and which he drove along the rugged coastline of Portugal at night in his dreams. He moved back to Lisbon with his wife and children and accepted a professorship at a university there. His comfort zone, as he calls it, with a secure income and a structured lifestyle. But he doesn't feel really happy. 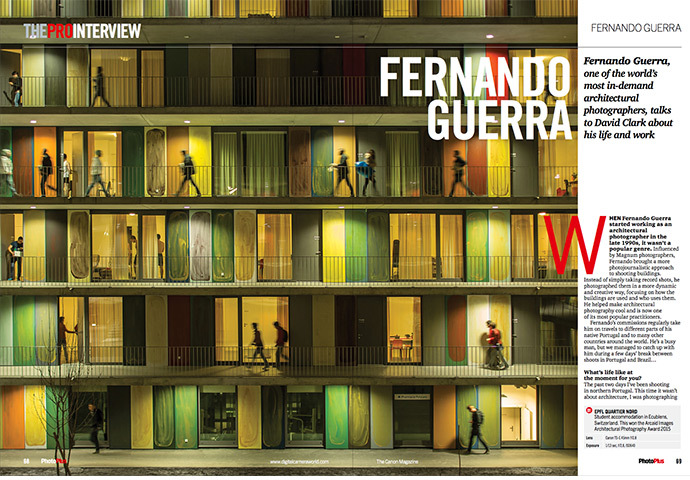 And so he comes to a decision..."
"Fernando Guerra is among the most celebrated architectural photographers in the world. He’s a master at giving structures of concrete and steel an air of ethereal lightness and infusing architecture with motion." four classic Porsche models from the years 1973 to 1995"
"It’s difficult to imagine a greater contrast between Fernando Guerra’s current location and the settings he normally finds himself in. The architectural photographer who captures futuristic buildings and breathtaking enfilades is standing in an ordinary garage. 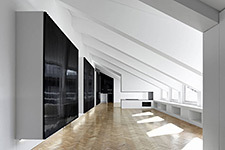 The austere, white room in central Lisbon is one of the most important places in his life. Outside, the raucous streets of the Portuguese capital are humming with activity— inside, behind the thick walls, it’s magnificently quiet. The garage is located on a little side street; an inconspicuous entrance with an electric door leads inside. The special thing about this decidedly ordinary location: in a space space roughly eight by eight meters, you’ll find four Porsche sports cars parked so closely that they’re almost touching. “My little family,” says Guerra, looking fondly at the quartet of cars in red covers. He finds the garage calming, a place where he can leave his work behind and clear his head, says Guerra." "No ArchDaily, o site de arquitetura mais visitado do mundo, não acreditamos que júris de “especialistas” sejam necessários para definir uma arquitetura de qualidade. 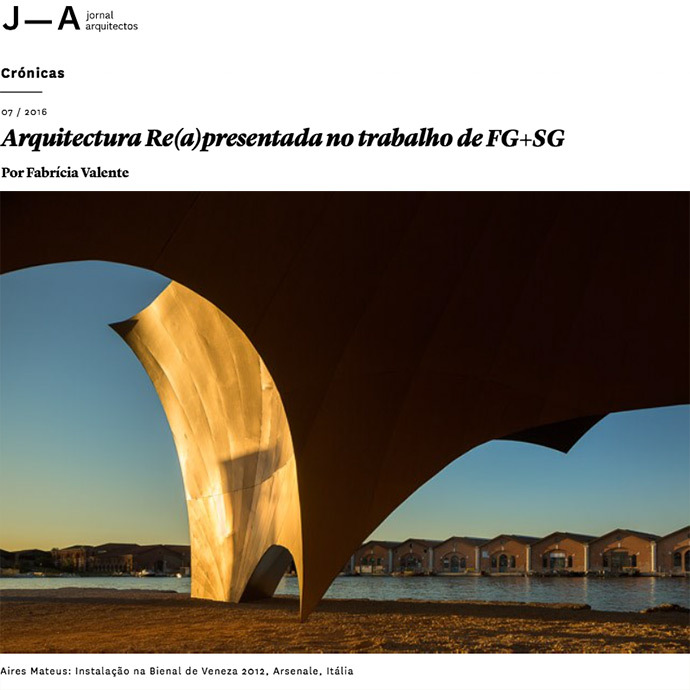 Os profissionais globais que compõem nossa rede de leitores são os verdadeiros jurados do nosso Prêmio Obra do Ano, em sua primeira edição no ArchDaily Brasil. Entre mais de mil projetos, nossos leitores selecionaram a melhor arquitetura produzida nos países lusófonos. Estes arquitetos e estudantes de diversas partes do mundo escolheram os três edifícios que - devido à sua estética, inteligência, criatividade ou serviço à comunidade - representam a melhor arquitetura do ano. 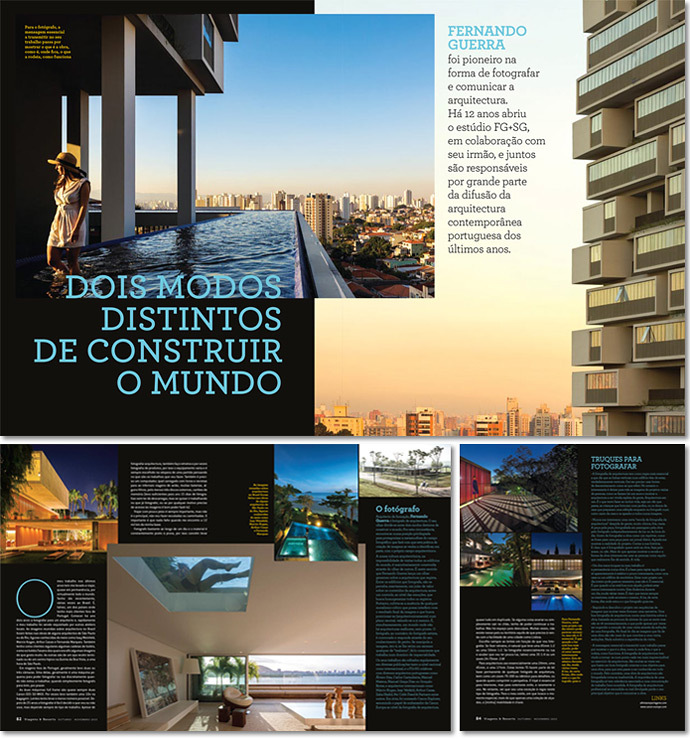 Este ano o ArchDaily Brasil fez parceria com a Saint Gobain para lançar esse prêmio para a comunidade de arquitetura. Aqui anunciamos os vencedores do Prêmio Obra do Ano de 2017, escolhido pelos votos de mais de 20.000 pessoas de todos os países de língua portuguesa, desde o dia 13 de Março. "A small group of photographers have turned their lenses on the urban landscape, seeking to capture the beauty of the architecture around us. The images explore the idea of sacred geometries, the perfect mix of proportion and mathematical ratios that are pleasing to the eye and a reflection of those found in nature. 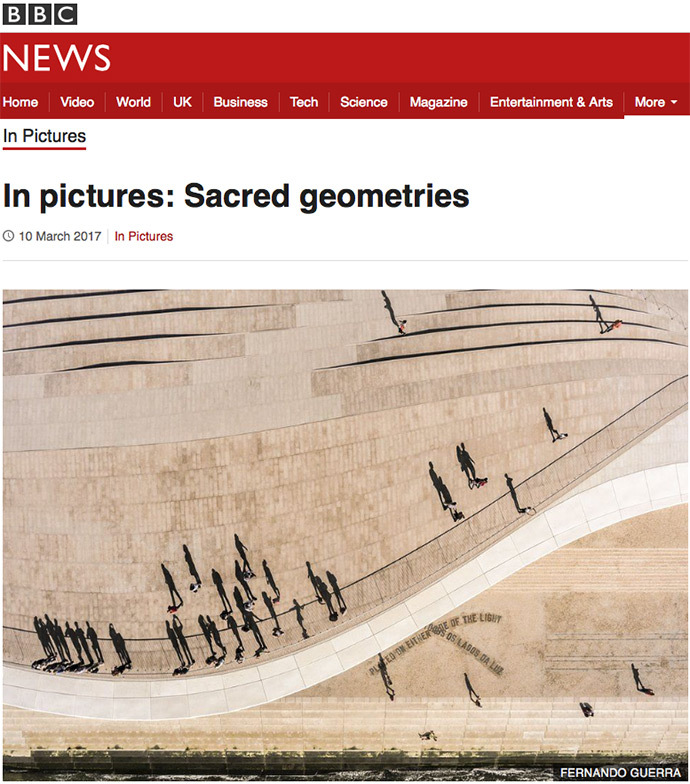 The pictures can be seen at the Anise Gallery in London until 15 April 2017"
Inspired by trends in contemporary photography and the diverse writings of Plato, author Robert Lawlor and architectural historian Peg Rawes, Anise Gallery is marking its fifth birthday with an exhibition of photography based on themes found in the sacred geometries. Geometry in aesthetics are unavoidable when traversing through the city, whether this is in grand scale such as skyscraper architecture, to the tiny backs of ladybirds. Intricate design can be located in both complex, constructed design patterns and in the minute details in nature. Aesthetics and mathematics come together in geometry, and have done since ancient Egypt, where geometrics were viewed as a visual manifestation of law and order. Later in ancient Greece, they had sacred and scientific properties in helping to solve earthly mysteries. Into the twenty-first century, we find ourselves in a world inundated with images, through social media, the press, search engines and the like. how are the world’s most sophisticated geometries best captured? Evidently, sacred geometries have value beyond that of the aesthetic, and are viewed as the coming together of mathematics, nature and spirituality, due to their use in religious iconography. ‘Sacred Geometry’ has various levels of complexity, from the sphere to the flower of life, each with their own significance in fields such as religious and mathematics. However, once these designs enter the realm of art and reproduction, they risk losing their aesthetic power and meaning, as products of the artist’s ideas instead of being autonomous. Does photography change this? The attraction to photography has always been its ability to depict its subject matter true-to-life; yet in a world of post-production and filters, aesthetic manipulation and embellishment are now prevalent in contemporary art, and ‘Sacred Geometries’ looks at how the two might come together, here in the polarising environments of nature and the metropolis. Whereas Lawlor focuses on sacred geometry’s ancient powers and mystique, architectural historian Peg Rawes has adapted these ideas into more contemporary ideas, incorporating the following elements: the reflective subject, folds, passages, plenums, envelopes and horizons. From an architectural point of view, this allows the transition from ancient symbolism to contemporary urban landscapes. Through the curation of an exhibition of film from Paul Raftery and Dan Lowe, and photography by Dennis Gilbert, Doublespace, Fernando Guerra, Hufton and Crow, Jim Stephenson and John MacLean, Anise Gallery hope to inspire and instigate a conversation surrounding Sacred Geometries. In collaboration with Miniclick an evening of short talks and discussion will take place on 6th Arpil. Fernando Guerra, one of the world’s most in-demand architectural photographers, talks to David Clark about his life and work. When Fernando Guerra started working as an architectural photographer in the late 1990s, it wasn’t a popular genre. Influenced by Magnum photographers, Fernando brought a more photojournalistic approach to shooting buildings. 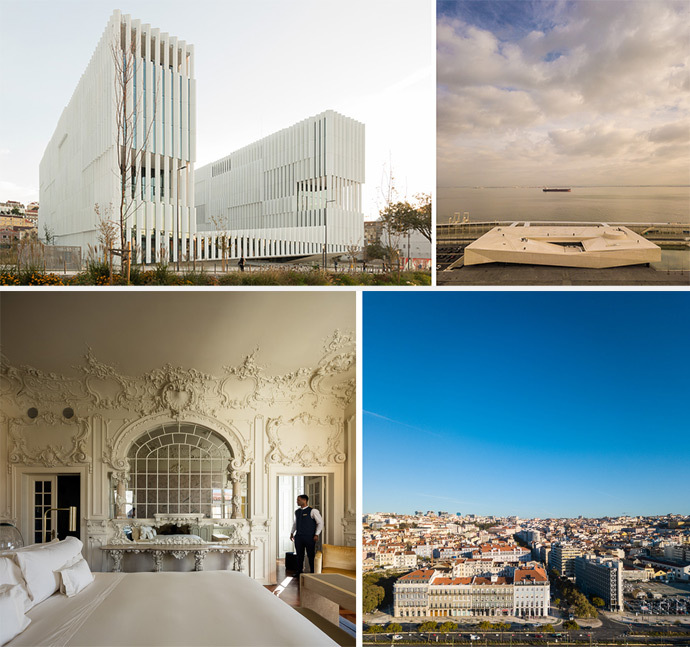 Foram anunciados os vencedores do Prémio ArchDaily Building of the Year de 2017 e dentro das 14 categorias premiadas, 2 projectos portugueses foram escolhidos por mais de 75.000 leitores entre 3.500 projectos publicados durante todo o ano de 2016. 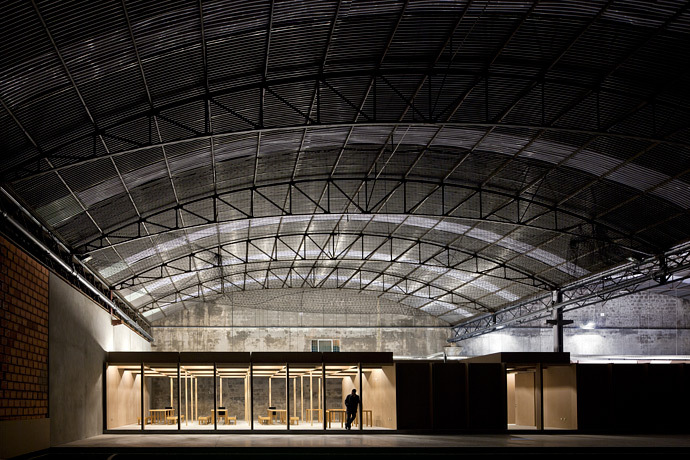 Luís Pedro Silva Arquitecto It was announced the winners of the Prize ArchDaily Building of the Year 2017 and in the 14 award categories, 2 Portuguese projects were chosen by more than 75.000 readers among 3.500 projects published throughout 2016. Esta exposição surge no âmbito das comemorações do 30.º aniversário da Universidade Lusíada de Lisboa, lugar de referência do Ensino Universitário em Portugal e tem como principal objetivo a revelação do património profissional e cultural, do qual este curso de Arquitectura foi agente. Falar de representação em Arquitectura pode conduzir-nos à leitura dos modelos institucionalizados que periodicamente expõem e debatem os diferentes contextos da disciplina, como são exemplo as grandes bienais internacionais, que dão lugar a espaços expositivos que também lançam a questão de como representar Arquitectura. Não havendo a possibilidade de ler a Arquitectura através da vivência dos espaços construídos é, de facto, a partir de documentos que conhecemos as suas obras. Assim, representação pode também remeter-nos às diferentes linguagens que ao longo do tempo serviram como suporte para apresentar a Arquitectura, como o desenho, a maqueta, a fotografia e o vídeo. Parece-me oportuno falar da plataforma criada por Fernando Guerra e Sérgio Guerra, um trabalho de diálogo entre a arquitectura e a fotografia, situando-a em ambas as leituras aqui apresentadas desta temática. As the winner of the Architizer award in the Architecture + Photography category, Fernando Guerra is featured in the newly released Phaidon book. The Architizer A+Awards celebrate the world’s best architecture every year. The winners were singled out amongst entries from over 100 countries by an international jury of over 300 experts and over 200,000 public votes. 60 categories of winners celebrate the diversity of the world’s architecture. There are giant towers, tiny apartments, a sinuous elevated bike path and a human-sized birdhouse. Architecture is everywhere and fulfills endless functions. This book celebrates all of them! 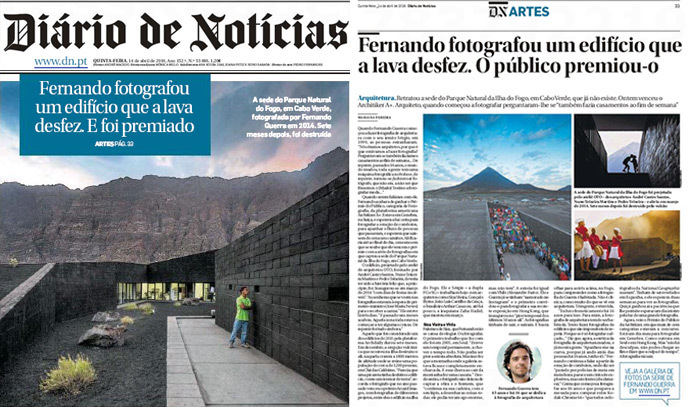 "Fotógrafo português vence Prémio Architizer"
"Retratou a sede do Parque Natural da Ilha do Fogo, Cabo Verde, que já não existe. Ontem venceu o Architiker A+. Arquiteto, quando começou a fotografar perguntaram-lhe se "também fazia casamentos ao fim de semana”. 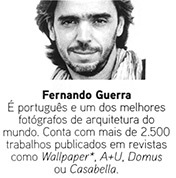 Quando Fernando Guerra começou a fazer fotografia de arquitetura com o seu irmão Sérgio, em 1999, as pessoas estranharam. "Nós éramos arquitetos, por que é que estávamos a fazer fotografia? Perguntavam se também fazia casamentos ao fim de semana... De repente, passados 16 anos, o mundo mudou, toda a gente tem uma máquina fotográfica no bolso, e de repente tornou-se fashion ser fotógrafo, que não era, a não ser que fossemos o [Mario] Testino, a fotografar moda..."
Quando ontem falámos com ele, Fernando acabara de ganhar o Prémio do Público, categoria de Fotografia, da plataforma americana Architizer A+. Estava em Genebra, na Suíça, e esperava a luz certa para fotografar a estação de comboios, para apanhar o fluxo de pessoas que passavam, e esperava que saíssem de cena uns camiões. Ali ficaria até ao final do dia, o mesmo em que se soube que ele vencera o prémio com a série de fotografias em que captou a sede do Parque Natural da Ilha do Fogo, em Cabo Verde. O edifício, projetado pelo ateliê de arquitetos OTO, formado por André Castro Santos, Nuno Teixeira Martins e Pedro Teixeira, deveria ter sido a história feliz que, a princípio, foi. Inaugurou em março de 2014 "com dias de festas incríveis". "As senhoras que se veem nas fotografias estavam à espera do primeiro-ministro [José Maria Neves] para o receber a cantar." Ele esteve lá três dias. "E passado uns meses acabou. Aquela zona toda estava a começar a ter algumas coisas. De repente foi tudo embora." Aquele que foi considerado um dos edifícios de 2015 pela plataforma Archdaily durou sete meses. Em dezembro, a erupção vulcânica que ocorreu na ilha destruiu-o ali, naquela cratera a 1800 metros de altitude em que se reúne uma população de cerca de 1200 pessoas, em Chã das Caldeiras. "Parecia que uma picareta tinha desfeito o edifício, como um tremor de terra", recorda o fotógrafo que no ano passado venceu o prémio Arcaid Images, com fotografias de diferentes projetos, entre eles o edifício na Ilha do Fogo. Ele e Sérgio - a dupla FG+SG - trabalham hoje com arquitetos como Siza Vieira, Gonçalo Byrne, João Luís Carrilho da Graça, o brasileiro Arthur Casas ou, até há pouco, a iraquiana Zaha Hadid, que morreu em março." 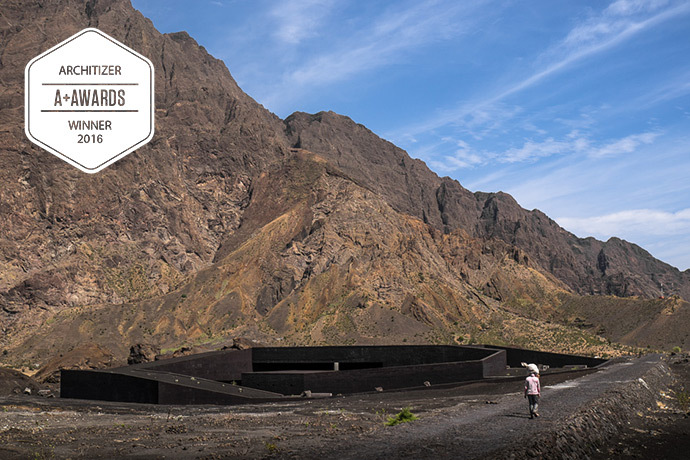 Fernando Guerra work on the Fogo Natural Park is the Architizer award winner in the Architecture + Photography category by public vote. Thanks to everyone, for voting in our project. Né en 1970 au Portugal, Fernando Guerra s’est lancé dans la photographie d’architecture à la fin des années 1990 pour être aujourd’hui actif dans le monde entier. En étant l’un des premiers à utiliser des appareils légers et en mettant des personnages sur ses images, il a su renouveler un genre qui était alors loin d’avoir la popularité qu’on lui connaît aujourd’hui. 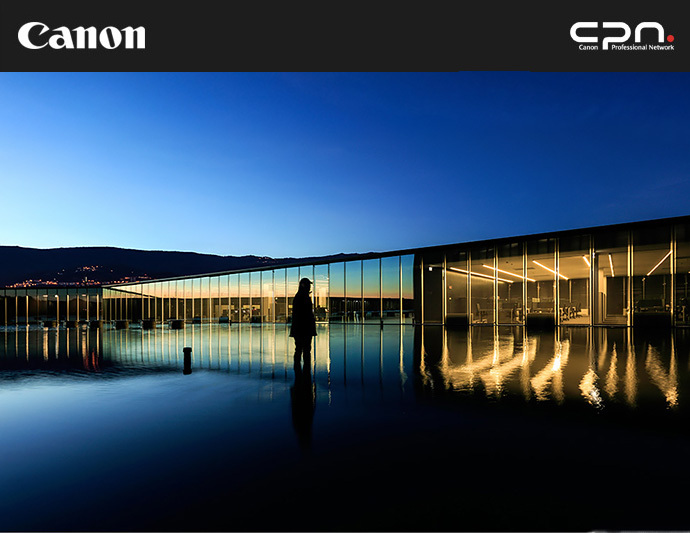 Fernando Guerra photos of Fogo Natural Park Venue are an A+Awards finalist! 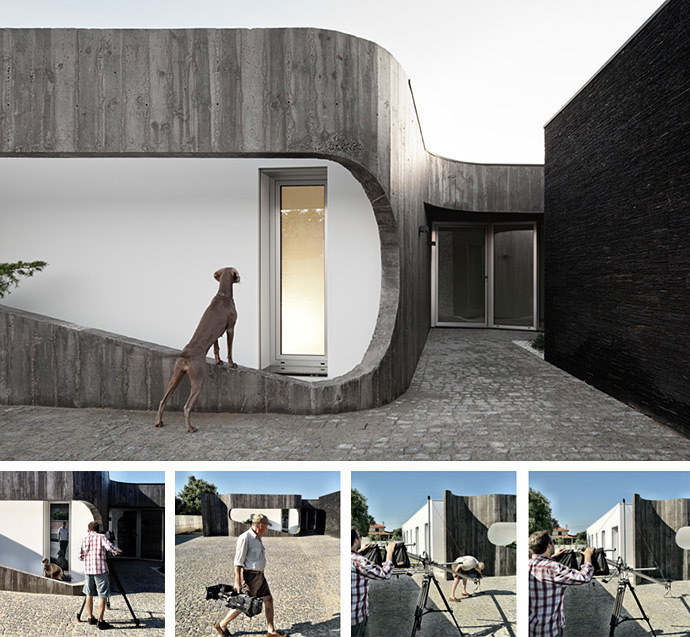 It´s among the 5 finalists of the international prize A+Awards promoted by the prestigious architecture platform ARCHITIZER. 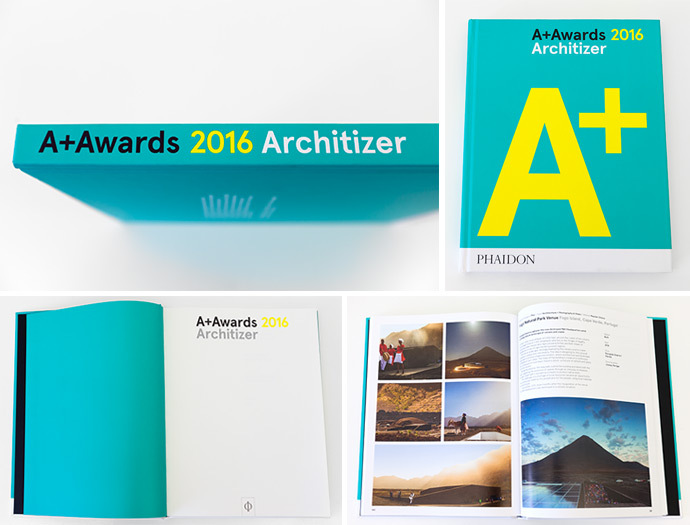 As finalists our work it´s nominated for two distinct awards: ARCHITIZER A+ JURY awards and ARCHITIZER A+ POPULAR CHOICE. 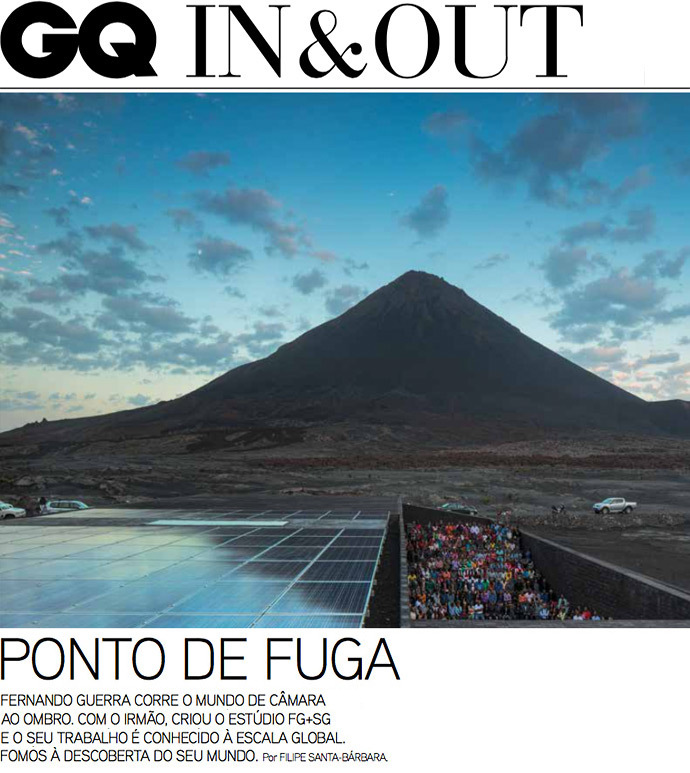 Vote Fogo Natural Park Venue in the "Architecture + Photography & Video category" here. "Quando se fala em fotografia de arquitectura, apenas um nome aparece destacado: Fernando Guerra. Este fotógrafo caçador de memórias acaba de ser distinguido com (mais) dois prémios pelo seu trabalho cá dentro e lá fora. 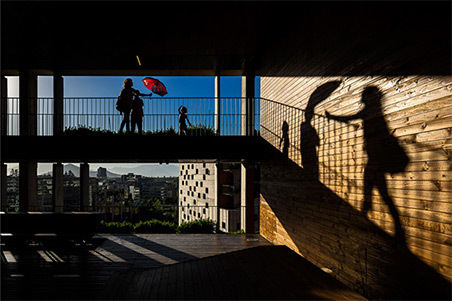 O fotógrafo Fernando Guerra foi o grande vencedor da edição do Arcaid Images Architectural Photography Award 2015. 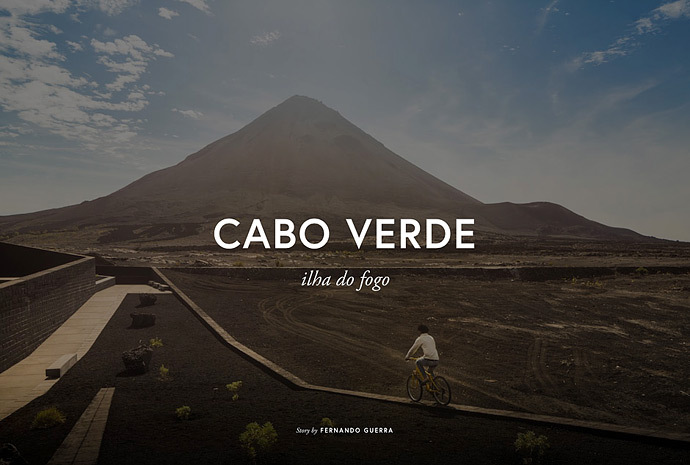 Das vinte fotografias finalistas, quatro delas pertenciam a este fotógrafo de arquitectura português, aclamado internacionalmente: uma de um projecto na Ilha do Fogo em Cabo Verde - O Parque Natural do Fogo (duas fotografias, uma na categoria de "Sense of Place" e outra no categoria de "Buildings in Use") e uma outra na categoria de "Interiors", uma fotografia de um projecto do arquitecto Pedro Gadanho em Torres Vedras. "When it comes to architectural photography, only one name stands out: Fernando Guerra. This photographer, hunter of memories, has just been distinguished with two (more) awards for his work at home and abroad. Photographer Fernando Guerra is the winner of the 2015 Arcaid Images Architectural Photography Award for an image in the category “Buildings in Use” of EPL Quartier Nord in Eclublens, Switzerland, a project by Richter Dahl Rocha & Associés. Of the twenty shortlisted photographs, another three belonged to this internationally acclaimed Portuguese architectural photographer: two of a project on Fogo Island in Cape Verde-The Fogo Nature Park (one in the category "Sense of Place", the other in "Buildings in Use"), and another in the category of "Interiors" from a project by architect Peter Gadanho in Torres Vedras. A quinta edição inclui uma selecção de obras representativa da sua diversidade, especificidade e qualidade. Está a arquitectura sob resgate? É o tema orientador da selecção. A equipa comissária (Luís Tavares Pereira, Bruno Baldaia, Magda Seifert) procurou indagar os impactos e as influências do contexto social e cultural que o país atravessa na produção de arquitectura. Austeridade, escassez, desemprego, emigração, diminuição do poder de compra, crise do mercado imobiliário: “são tópicos que não conseguimos dissociar de uma reflexão profunda que incide sobre as condições da construção e da arquitectura nos anos 2012, 2013 e 2014” afirmam os comissários. O projecto tem um núcleo central permanente, com 80 obras expostas de forma sintética, e conteúdos originais concebidos pelos comissários. Poderão também ser vistos registos vídeo originais sobre as obras em foco em cada etapa. 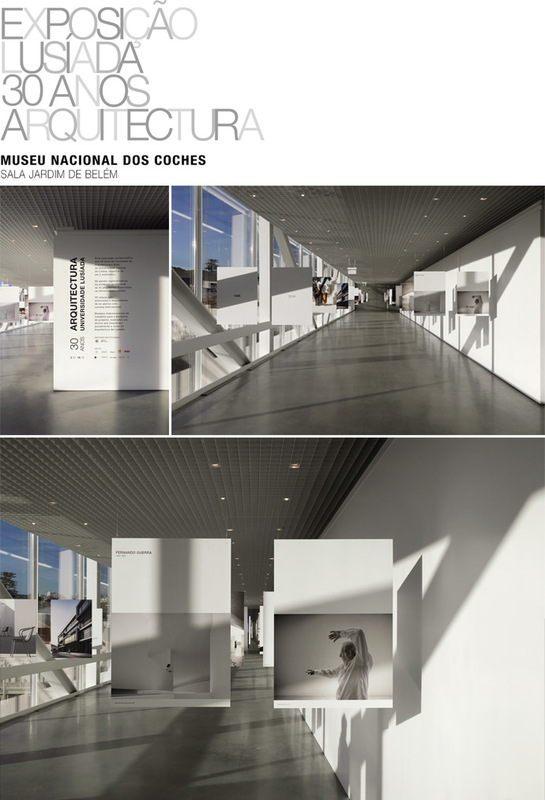 Foram anunciados os vencedores do Prémio ArchDaily Building of the Year de 2016 e dentro das 14 categorias premiadas, 3 projectos portugueses foram escolhidos por mais de 55.000 leitores entre 3.000 projectos publicados durante todo o ano de 2015. 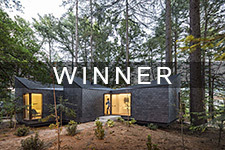 Casa em Guimarães / Elisabete de Oliveira Saldanha It was announced the winners of the Prize ArchDaily Building of the Year 2016 and in the 14 award categories, three Portuguese projects were chosen by more than 55.000 readers among 3.000 projects published throughout 2015. 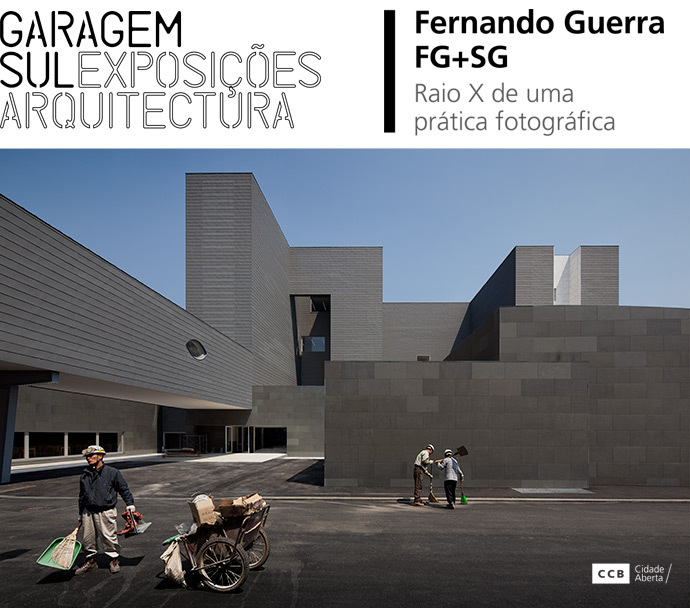 A exposição mostra todos os nomeados e as imagens vencedoras do Arcaid Images Architectural Photography Awards 2015, apresentando alguns dos mais renomeados fotógrafos de arquitectura, incluíndo o grande vencedor Fernando Guerra. A exposição está dividida em quatro categorias que exploram diferentes qualidades arquitectónicas e diversas abordagens e metodologias. As categorias Building in use, Exteriors, Interiors and Sense of place demonstram um amplo espectro de estilos e abordagens fotográficas bem como uma excepcional diversificação de formas arquitectónicas. Pelo terceiro ano, a Sto Werkstatt em parceria com a Arcaid Images apresenta “Building Images”, desenvolvendo uma plataforma que explora e celebra as qualidades dos fotógrafos de arquitectura, encorajando o debate sobre a disciplina entre fotógrafos, arquitectos e entusiastas. 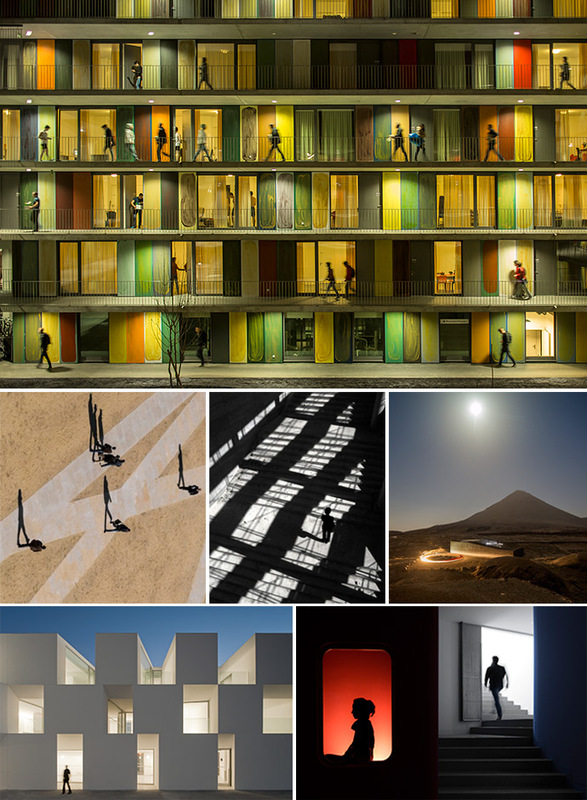 Imagens da cerimónia de entrega dos prémios e da exposição: The exhibition showcases all the shortlisted, and winning images from The Arcaid Images Architectural Photography Awards 2015, and features some of the world’s most renowned architectural photographers including overall winner Fernando Guerra as well as short listed entrants. The exhibition is divided into four categories that explore different architectural qualities and a diverse technical approach and methodology. The categories Building in use, Exteriors, Interiors and Sense of place demonstrate a broad range of photographic styles and approaches to the medium as well as featuring a diverse set of outstanding architectural forms. This is the third year, Sto Werkstatt in partnership with Arcaid Images has presented Building Images and we are proud to continually create this platform to explore and celebrate the skills of architectural photographers, and to encourage debate around the discipline among photographers, architects and enthusiasts alike. 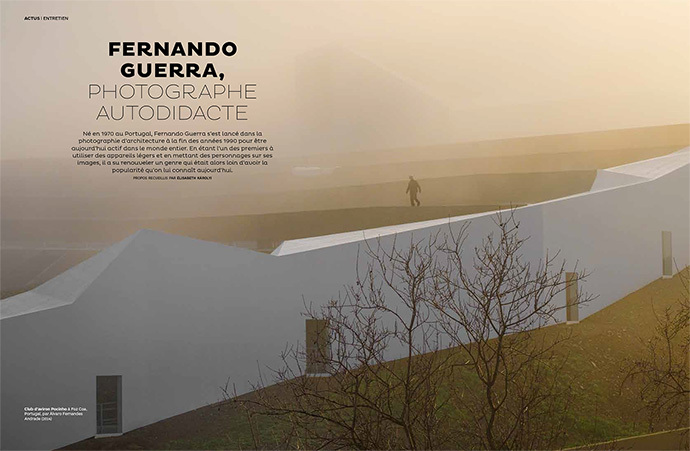 Fernando Guerra wins the Photographer Award "Obra del Año 2015"
Fernando Guerra vence o Prémio Fotógrafo "Obra del Año 2015"
Um mês depois de ter ganho a mais importante distinção na fotografia de arquitectura, o prémio Arcaid, Fernando Guerra foi o vencedor da primeira edição do grande prémio de fotografia do site Plataforma Arquitectura com o seu trabalho fotográfico sobre a obra do ano 2015: A Faculdade de Economia e Negócios da Universidade Diego Portales, em Santiago do Chile, projecto eleito pelos leitores do site Plataforma Arquitectura, entre mais de 1000 projectos na América do Sul. O prémio foi entregue em cerimónia realizada no dia 26 de novembro de 2015 na referida Faculdade. 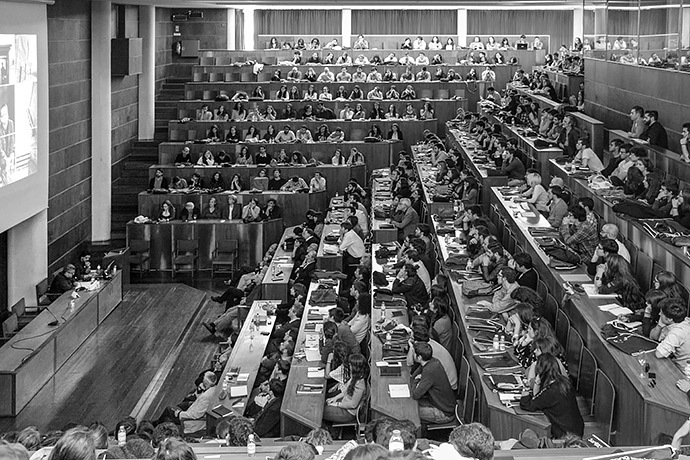 One month after winning the most important architectural photography award, the Arcaid award, Fernando Guerra has won the grand prize for photography on the Plataforma Arquitectura website with his 2015 photos of the Faculty of Economics and Business of the University of Diego Portales in Santiago, Chile. This project was chosen from among more than 1,000 others in South America with voting carried out by readers of the website. The award was presented at a ceremony held on November 26, 2015 in the winning building itself. Fernando was featured on a new book were experienced and successful photographers, like Art Wolf, Ron Haviv, Frans Lanting among many others, talk about their images; how and why they chose to make them, what motivates their photography, and the background behind the image. Image and photographic details are provided for each shot. Discover how successful and award-winning photographers create their images. Gain inspiration from their photographs. Read their advice. 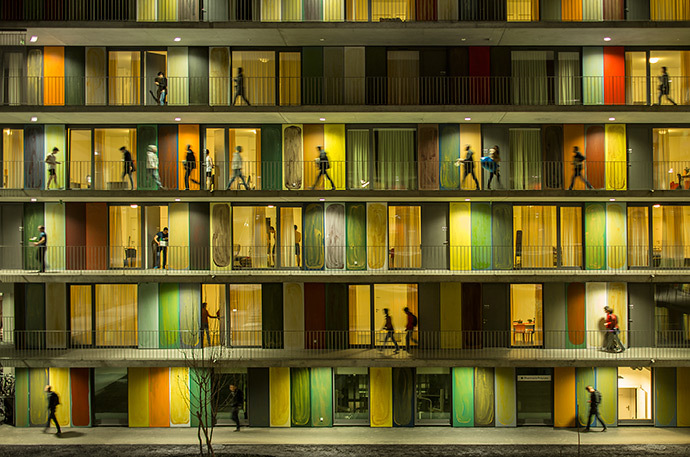 Fernando Guerra's stunning image of Richter Dahl Rocha & Associés' EPFL Quartier Nord in Ecublens, Switzerland, has won the Arcaid Images Architectural Photography Award. 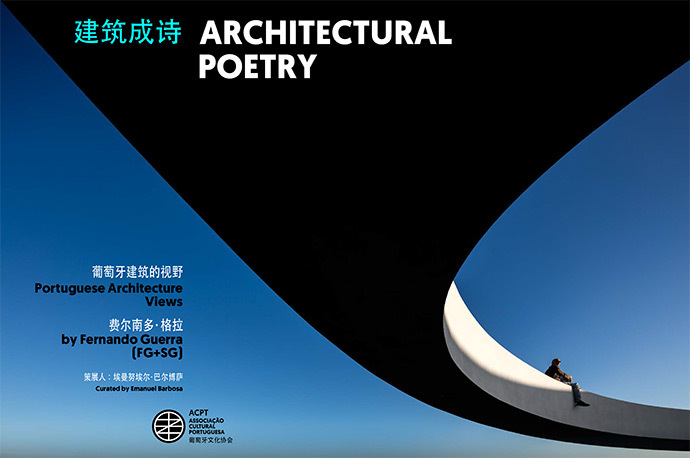 Announced at the ongoing World Architecture Festival (WAF) in Singapore, the image was selected by a panel of judges for its ability to "translate the sophistication of architecture into a readable and understandable two dimensions". 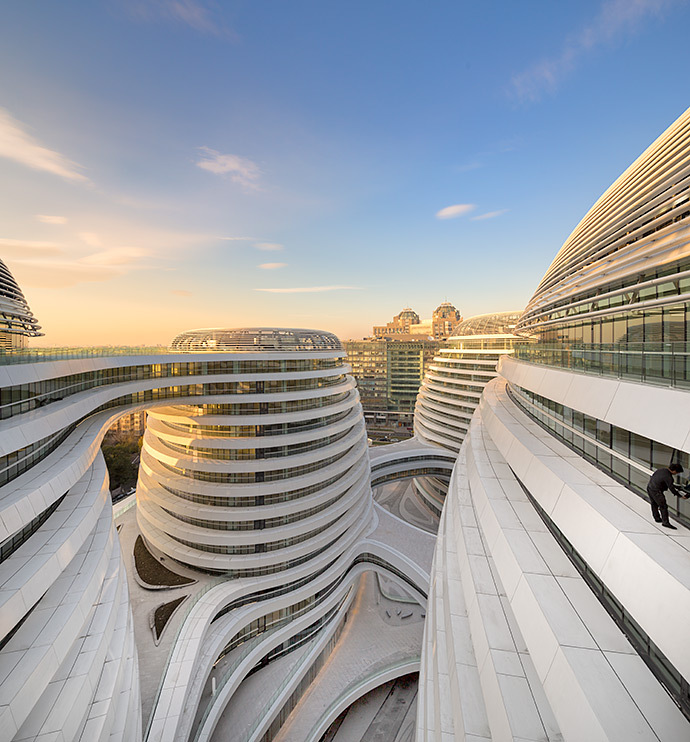 Arcaid has shortlisted 20 of the year's best architectural images for their 2015 awards - The annual Arcaid Images Architectural Photography Awards. 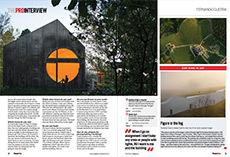 The images were presented in four categories - Exteriors, Interiors, Sense of Place, and Building in Use - and judged by an esteemed panel on their atmospheric quality, composition, use of scale and more. "The architecture itself is the focus and the image regarded only as the medium. 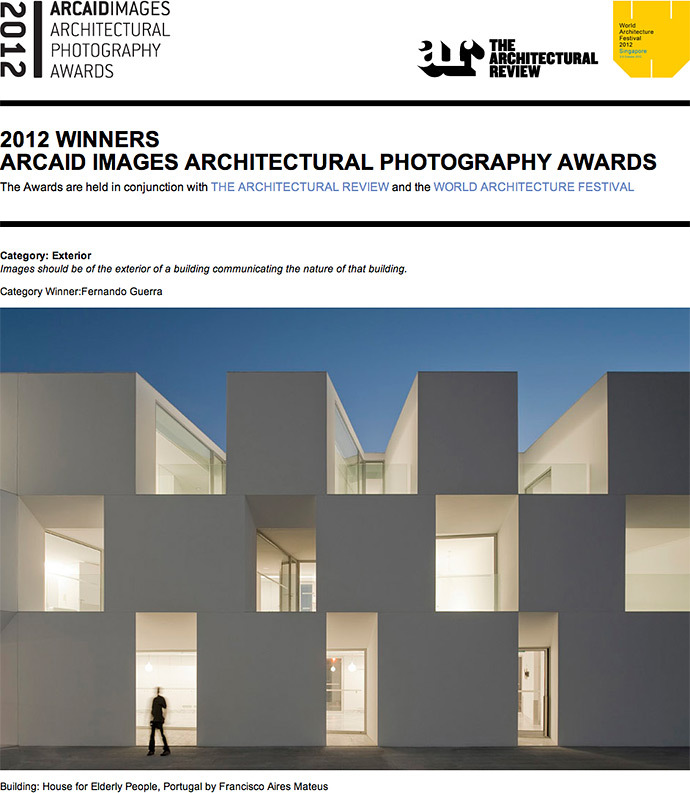 The Arcaid Images Architectural Photography Award aims to put the focus onto the skill and creativity of the photographer,” said the Award’s organizers. Each shortlisted image was judged on the merits of the photography for composition, sense of place, atmosphere and use of scale; Guerra had the highest scoring image overall. 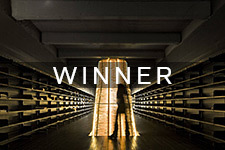 “The high level of photography has made it a very difficult the task to choose the winners. The most important thing for us has been the concept and atmosphere of the images. 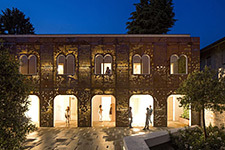 How they have been perceived and expressed through the creativity and inspiration of the photographer,” said architects and jury members Fabrizio Barozzi and Alberto Veiga. Fernando Guerra corre o Mundo de câmara ao ombro, com o irmão, criou o estúdio FG+SG e o seu trabalho é conhecido à escala global. Fomos à descoberta do seu Mundo. “Se podes olhar, vê. Se podes ver, repara.” A epígrafe de Ensaio sobre a Cegueira, de José Saramago, é um bom conselho para quem olha para as imagens que dão corpo a estas páginas. O seu autor é Fernando Guerra, fotógrafo de arquitetura português e embaixador europeu da Canon na qualidade. 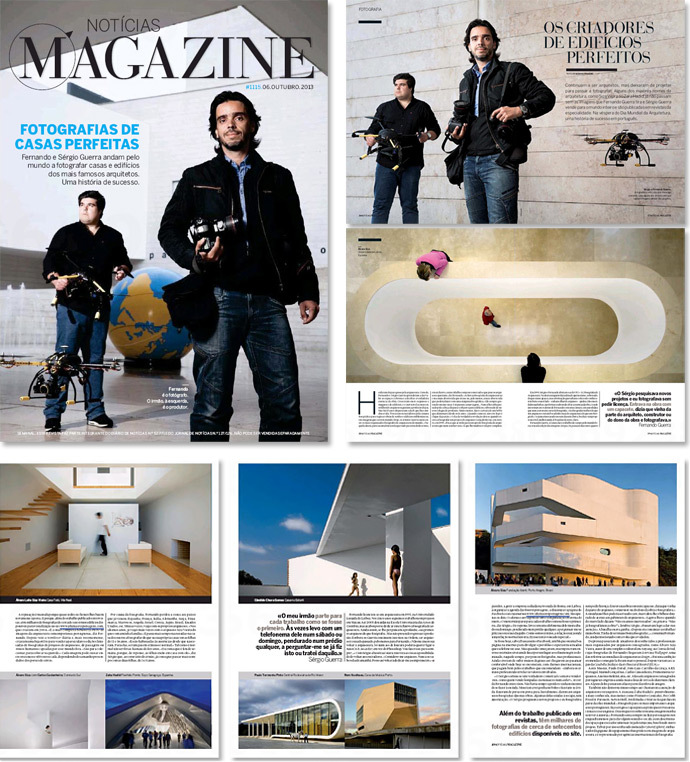 Com trabalhos editados em publicações como “Wallpaper”, Casabella, Domus ou A+U, este lisboeta é o fotógrafo de Álvaro Siza Vieira e já colaborou com arquitetos internacionais como Márcio Kogan, Zaha Hadid e Isay Weifeld. Entre aeroportos, Guerra confessa à GQ que a fotografia surgiu bastante mais cedo do que a arquitetura. “Com 16 anos, comecei a fotografar, só porque sim. Podia ter largado essa novidade, como qualquer adolescente larga um hobby do qual se aborreceu, muito rapidamente, mas a fotografia fez-me bem e, na verdade, passado uns meses, a vida ganhou outro interesse, outra cor”. 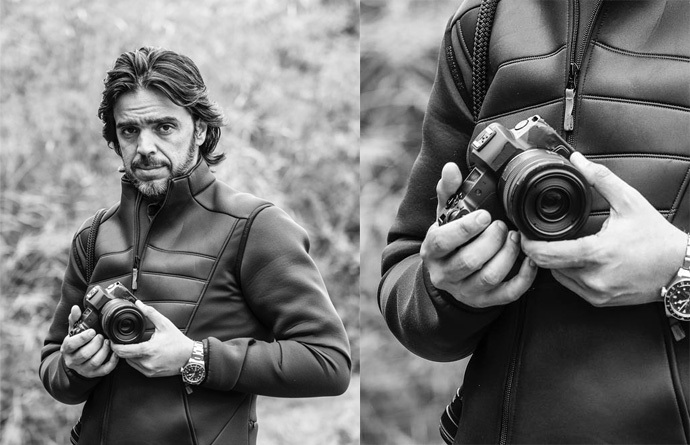 Fernando Guerra, who runs around the World with a camera on his shoulder, created FG+SG studios with his brother. His work is known on a global scale. We’ve gone to discover his World. "If you can see, look. If you can look, observe." The epigraph in the novel Blindness, by José Saramago, is good advice for anyone looking at the images that occupy these pages. The author is Fernando Guerra, Portuguese architectural photographer and an Explorer in Canon Europe’s Ambassador Programme. With works published in publications such as Wallpaper, Casabella, Domus or A+U, this Lisboan is the photographer for Álvaro Siza Vieira and has collaborated with international architects such as Márcio Kogan, Zaha Hadid and Isay Weifeld. 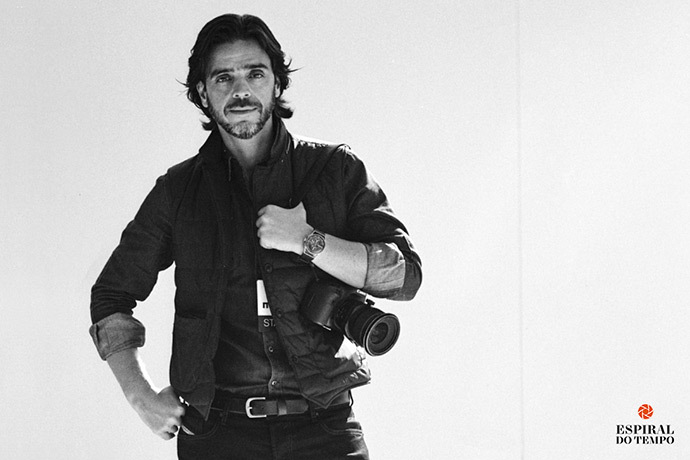 Between airports, Guerra confesses to GQ that photography came to him much earlier than the architecture. "At 16, I began taking pictures, just because I could. I could have dropped this novelty, like any teen that drops a hobby that quickly becomes boring, but photography was good for me and, in truth, a few months later, life got more interesting, more colourful". O recém-inaugurado Museu dos Coches, em Lisboa, causa estranheza à primeira vista. A simplicidade dos volumes contrasta com a complexidade do entorno, sem dúvida, o mais importante espaço da cultura lusófona. Ali estão o Mosteiro dos Jerónimos e a torre de Belém, à beira da magnificência do Tejo, de onde os portugueses saíram para descobrir o mundo; e os incontornáveis pasteis de nata, para onde aflui a gula dos turistas de todo o mundo. Por trás do imponente paralelepípedo branco, a flutuar polemicamente sobre os alfacinhas, está a elegância modesta de Paulo Mendes da Rocha. Em meados de 2008, num Portugal ainda inocente quanto às agruras da anorexia fiscal, dizem as más línguas que o então ministro da Economia convidou certa dupla de arquitetos suíços para construir o museu, o que foi prontamente declinado por conta do prazo pouco germânico que havia sido proposto. Em seguida, após breve delírio anglo-iraquiano, que teria levado Camões e Vasco da Gama a preencherem os papeis para um exílio no São João Batista, os monumentais Álvaro Siza e Eduardo Souto de Moura teriam convencido o ministro da escolha natural do então recém-pritzkerizado paulistano. Fernando Pessoa, que tinha ficado desassossegado, pôde cair no sono depois que Dom Sebastião prometeu que o sertão não ia mais virar mar. Nada teria sido mais justo que chamar nosso gênio tupiniquim para fazer uma pororoca desaguar no Tejo. Em seu igualmente modesto escritório no centro de São Paulo, em meio à força da grana que ergue e destrói coisas belas, Paulo Mendes da Rocha nos recebe com desconcertante sagacidade, do alto de seus 86 anos. Entre cigarros empunhados com a mesma precisão das palavras pronunciadas, nos explica que aceitou o convite por poder contar com o apoio do grande engenheiro, Rui Furtado, e do promissor arquiteto, Ricardo Bak Gordon, além da equipe parceira de décadas do escritório MMBB. Visitou Lisboa e buscou trabalhar com o terreno dentro daquela geografia construída pelo homem: o aterro roubado do rio e dissociado deste pela linha dos trens que partem do Cais do Sodré; a pitoresca rua da Junqueira com seus bondes e casas d’antanho; o delicado rosa do palácio de Belém e a barrocamente gótica arquitetura manuelina do Mosteiro e da Torre; a praça do Vice-Rei das Índias e a suave inclinação da ladeira da Ajuda. O lençol freático teria tornado inviável qualquer tentativa de subsolo e a escala da maior coleção de carruagens do mundo pedia espaços proporcionais. Muito naturalmente, foi criado um grande volume, contendo duas salas de 20 metros de largura, 135 metros de comprimento e 8.5 metros de altura. Ali, na sobriedade do concreto e do branco, protegidos pela eternidade de um edifício, ficariam esses grandes engenhos da mecânica, recobertos de ouro, Netunos e outros adornos sobre quatro rodas. O resto do programa, qual seja, os ateliers de restauro, espaços de administração, um auditório e um incontornável "restaurant, para mostrar o que Portugal tem de melhor", nas palavras do próprio Paulo, foi deslocado ou para as vistas do público na porção envidraçada do térreo ou para o anexo na esquina da rua da Junqueira. Se a arquitetura é a arte de trabalhar os vazios, o Museu dos Coches já se afirma como obra prima: entre o volume principal e o anexo, criou-se uma piazzeta, a estimular os fundos dos edifícios históricos a criarem urbanidade dentro do miolo fo lote antes isolado, conectado ao entorno por uma rica coleção de espaços públicos sob os vãos e por entre as ruelas dos recuos entre os pavilhões do museu e o contexto. Sob o anexo, o volume do auditório é pintado de rosa, "como quem pega uma casinha daquela e põe lá dentro". Cosa mentale. Ouvir Paulo Mendes da Rocha descrever, despretenciosamente, a « transformação da mesma coisa, uma transformação do lugar, antes de mais nada » é desconcertante. Em poucos minutos, a solução arquitetônica do museu aparece como evidência geográfica, completada pela proposta de um estacionamento do outro lado dos trilhos, na beira do Tejo, a abrigar os coches de hoje, "latas de 700 quilos para transportar um cretino de 70, pintadas em cores brilhantes". Para cruzar o Rubicão, uma passarela desdobra-se desde o anexo, margeia o volume principal e chega até o estacionamento, apesar de, infelizmente, as rampas ainda estarem escondida por trás de tapumes e de o volume circular do estacionamento permanecer na prancheta. Deixemos o existente e apenas ouçamos o elogio da engenhosidade da construção do porvir, "que não é minha, já existe em Portugal, chamam-no silo de estacionamento". Surgem rampas suaves, inclinadas como numa rua, enroscando-se até abrigar algumas centenas de carros. Painéis perfurados, desses pré-fabricados, protegendo da chuva e do vento, revelam os faróis à noite, brincando com o escuro e com o infinito do círculo, "já por si, um espetáculo extraordinário". Aquilo há de terminar e "por que não? ", num terraço esplêndido, horizontal, com vistas para o rio, o mais belo terraço de Lisboa nas noites de réveillon. E quando os carros virarem peças de museu, tudo aquilo deve virar lojas, um hotel, restaurantes… Voltemos à incompletude do que há. Enquanto o anexo fascina por sua clarabóia à la Artigas, tramando sombras no térreo, o volume principal intriga pelo hermetismo. As gigantescas vigas da estrutura de aço são reveladas por delicados trapézios que viram portas, vitrines e abrigam passarelas. Os dois grandes salões são separados pelos espaços das duas vigas intermediárias que, ligadas às oficinas de restauro do térreo, servem como áreas técnicas para o museu. A circulação dos visitantes faz-se em fluxo contínuo, por dois elevadores que são verdadeiras plataformas de transporte público, com capacidade para 75 passageiros cada. 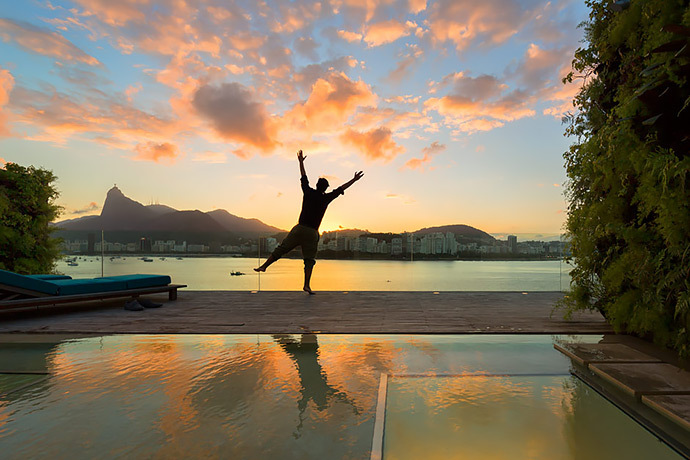 Nos salões, apenas dois rasgos horizontais opostos enquadram o exterior, "como naqueles panoramas marinhos que tantos pintaram no Rio de Janeiro". De um lado, vê-se a ponte 25 de abril e Lisboa a subir os montes; do outro, cabeças levitam sobre a passarela, na mesma altura dos visitantes dentro do museu, com o Tejo e Belém como pano de fundo. A museologia de Nuno Sampaio toma em consideração as possibilidades presentes e futuras das projeções. Os coches seculares serão explicados por meio de imagens e, quem sabe um dia, hologramas, capazes de contextualizá-los enquanto objetos da história e da mecânica. Entretanto, é forçoso constatar que, hoje, o museu abriu apenas com parte do seu potencial. A Bamboo o visitou há poucas semanas e os tapumes ainda presentes, a museologia desrespeitada, além de duvidosos cavalos de cera, não fazem todavia jus ao museu mais frequentado de Portugal. Pronto há mais de dois anos, o edifício tornou-se símbolo da polarização política e virou objeto de politicagem durante a crise econômica. O governo o manteve inexplicavelmente fechado como retrato de uma austeridade desinteligente, enquanto poderia já ter gerado renda, e o abriu sem ter construído o estacionamento ou efetivamente respeitado o projeto museológico. Polêmicas à parte, a atemporalidade da obra de Paulo Mendes da Rocha seguirá brilhando, malgrado o tratamento indevido que possa ser dado ao edifício em si. Depois de horas de uma conversa esclarecedora com um arquiteto que, assim como Niemeyer, nas palavras de Vinicius de Morais, é um dos "mais antiautopromocionais que existem", a estranheza desfez-se. Resta apenas uma profunda admiração e o desejo que seja completado o genial poema de pedra de nosso imenso conterrâneo. O ciclo que esta exposição integra foi proposto pelo MNAA, em 2012, à Fundação EDP, e tem sido produzido pela equipa da DuplaCena/Horta Seca. A edição deste ano, a quarta, é comissariada por João Pinharanda, que acumula funções de programação na Fundação EDP. A escolha apresentada é apenas um esboço. A atitude artística que orienta este trabalho exige a aceitação de sobreposições temáticas, das fugas e desvios de sentido, das zonas de crítica e ironia de cada discurso individual. O edifício é registado na tentativa de perceber os tempos e os corpos construídos que nele se sobrepõem ou fundem; no desejo de perceber a relação do “dentro” e do “fora”, as diferentes espessuras da sua pele, os balanços de volume e peso, a coerência ou deslocação das suas articulações. Cá fora: o jardim, o rio, a cidade (umas vezes belíssima, outras marginal). No seu interior: a passagem do tempo, espelhada na sequência histórica das obras expostas mas também nos pormenores de construção, no desenho dos mobiliários expositivos, nas soluções de montagem. O MNAA aproxima-se de um grande ciclo de renovação. Mas cada renovação preserva sempre parte do passado. Num próximo futuro, através deste Catálogo, perceberemos bem o deslizar do tempo: os jogos de continuidade, de sobreposição e separação de que se fazem os Museus e o Mundo. As imagens de Fernando Guerra permitem-nos uma viagem vertiginosa pelas salas do Museu – como se ele nos desse um único plano-sequência fílmico. A centralidade das composições, a justeza das cores, a solução de apresentação das imagens em grelha constitui, porventura, o mais completo catálogo da montagem interior das salas do Museu desde os repositórios históricos dos estúdios Novaes. No entanto, o equilíbrio de todos os elementos de composição gera incomodidade em quem olha e obriga-nos a descobrir, na aparente perfeição desse real, elementos de desacerto e erro. A viagem de arquitectos é sempre uma viagem de confrontação. Confrontam-se modelos, visões do mundo, arquitecturas. «Aprender com a Viagem» propõe uma reflexão sobre a importância da viagem na formação disciplinar. No Departamento de Arquitectura da UC estas viagens, organizadas por estudantes e professores, são uma parte essencial e recorrente da aprendizagem, ano após ano. Elas constituem um património robusto, que pretendemos tornar tangível. Propõe-se uma reflexão comum, com outros arquitectos vindos de outras paragens, outros viajantes que partilham desta convicção acerca do sentido pedagógico da viagem. Este colóquio conta com a presença de Álvaro Siza, no debate de encerramento, e comunicações por Alexandre Alves Costa, Carlos Castanheira e Fernando Guerra, José Fernando Gonçalves, José Gigante, Luís Miguel Correia e Sérgio Fernandez. Será igualmente lançado o livro «Viagem à América», que resulta de uma ousada viagem, organizada no âmbito da disciplina de Projecto V do Mestrado Integrado em Arquitectura. Professores e estudantes viajaram aos Estados Unidos da América, em Maio de 2011, e visitaram Nova Iorque, Chicago e algumas outras obras emblemáticas, entre as quais Taliesin East, no Wisconsin (F.L. Wright, 1911-1959), a Fallingwater House, na Pensilvânia (F.L. Wright. 1936), ou a Farnsworth House, em Plano, Illinois (Mies van der Rohe, 1951). Um dos mais prestigiados museus do mundo, o MoMa em Nova Iorque teve a iniciativa de adquirir para a sua colecção dedicada à arquitectura cinco fotografias de Fernando Guerra, que pertencem agora aos seus arquivos e nos enchem de orgulho. Torna-se assim o único fotógrafo de arquitectura português representado num dos mais importantes espólios de arquitectura mundial. It is with great pride that we announce that New York's MoMA, one of the world's most prestigious museums, has acquired five photographs by Fernando Guerra for its selection of works dedicated to architecture. 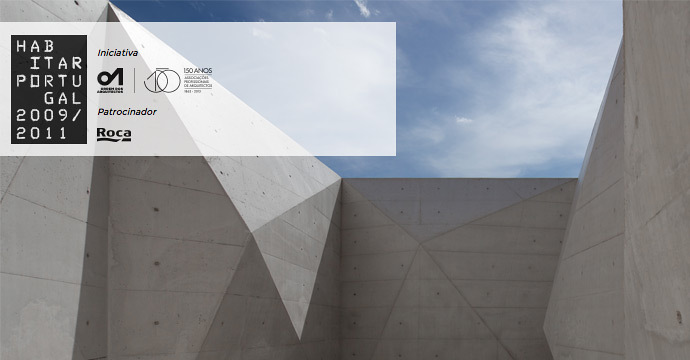 Fernando Guerra thus becomes the only portuguese architectural photographer to be represented in one of the most important collections of world architecture. Nos últimos quatro anos Fernando Guerra tem fotografado consistentemente a obra de vários arquitectos brasileiros de renome, mantendo uma forte relação que tem cimentado um arquivo já extenso e crescente da obra admirável e premiada deste núcleo de arquitectos. Reunimos assim alguns exemplos dos projectos de Isay Weinfeld, Marcio Kogan, Arthur Casas e Fernanda Marques que testemunham este elo luso-brasileiro, legitimado pelo recente convite do Archdaily Brasil que elege Fernando Guerra como seu parceiro. 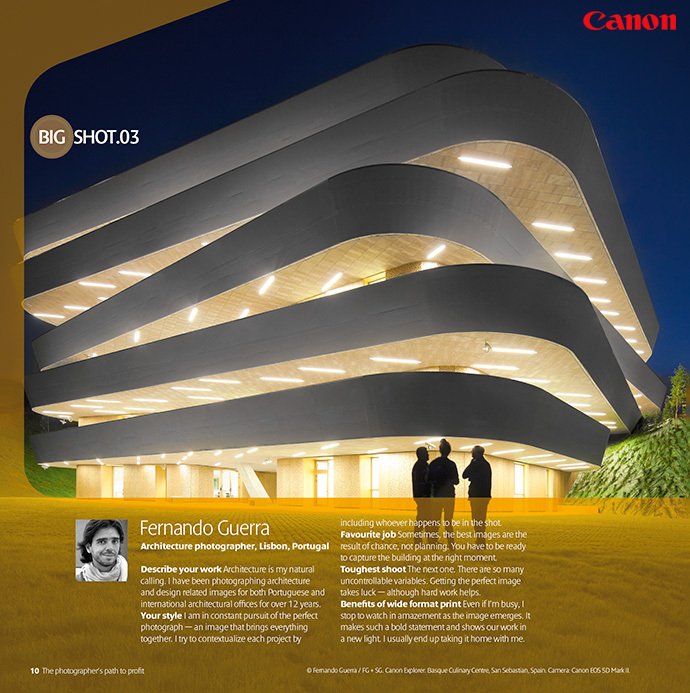 Over the past four years Fernando Guerra has consistently photographed the work of several renowned Brazilian architects, maintaining a strong relationship that has cemented an already extensive and growing archive of the admirable work by this award-winning group of architects. 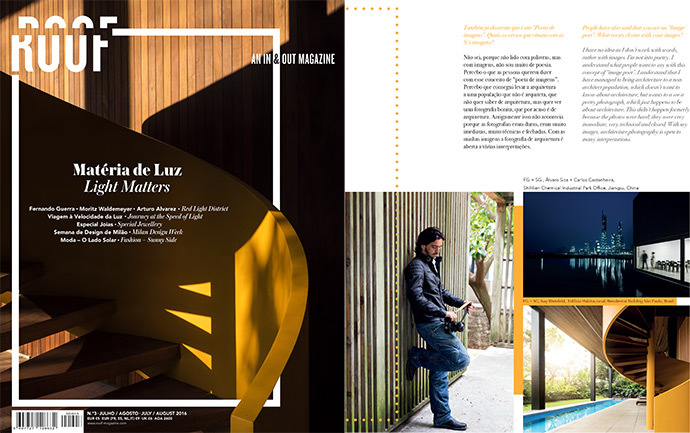 Consequently, we bring together some examples of projects by Isay Weinfeld, Marcio Kogan, Arthur Casas and Fernanda Marques which are representative of this Luso-Brazilian connection, legitimized by the recent invitation from ArchDaily Brazil to choose Fernando Guerra as its partner. 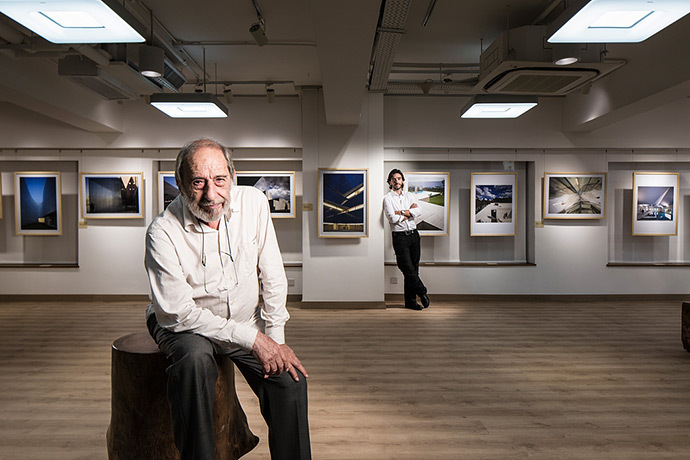 Inaugurou em Macau uma exposição retrospectiva de Fernando Guerra pela obra de Álvaro Siza ao longo dos ultimos dez anos, que reúne 50 obras em 56 fotografias e que reflecte alguns dos melhores momentos de ambos, perseguindo na luz a modelação da sua obra, uma arquitectónica, a outra fotográfica, como refere Carlos Castanheira no texto da exposição que intitulou “A Sombra da Luz - Retratos de Álvaro Siza por Fernando Guerra”. No futuro, haverá um livro, um diário de bordo, em que se verá uma amostra das 25 mil fotografias que foram tiradas durante esta travessia — de obras, claro, mas não só. "O lado pessoal [de Siza Vieira], que eu consegui nos últimos anos, para mim não tem preço", revela o fotógrafo que, ao fim de todos estes anos, terá certamente o 'melhor arquivo do Siza de sempre'. " Fernando Guerra acompanhou Álvaro Siza e Carlos Castanheira numa viagem de um mês pela Ásia, por si documentada e partilhada informalmente no Instagram nos momentos mais íntimos e espontâneos dessa aventura. Oficialmente tiveram lugar as inaugurações dos projectos The Building on the Waterna China e o Taifong Golf Club em Taiwan, que foram aclamadamente recebidos internacionalmente e que originaram imagens e reportagens ímpares que documentam para a posteridade esta epopeia asiática. Pelo meio de compromissos e inaugurações a omnipresente obsessão de Siza em desenhar, nunca descansando a caneta entre escalas de avião, conferências de imprensa ou toalhas de restaurante foi também testemunhada e captada à luz da cumplicidade com Fernando e da sua objectiva, que deixa por momentos os alçados para captar o génio íntimo da pessoa. 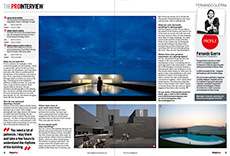 "About one month ago, three major figures in Portuguese architecture – Pritzker Laureate Álvaro Siza, architect Carlos Castanheira and one of today’s most prominent architectural photographers, Fernando Guerra - began an uncommon adventure. During 22 days the architects traveled through many Asian countries inaugurating buildings, visiting new projects and meeting other architects like Pritzker Laureate Whang Shu. 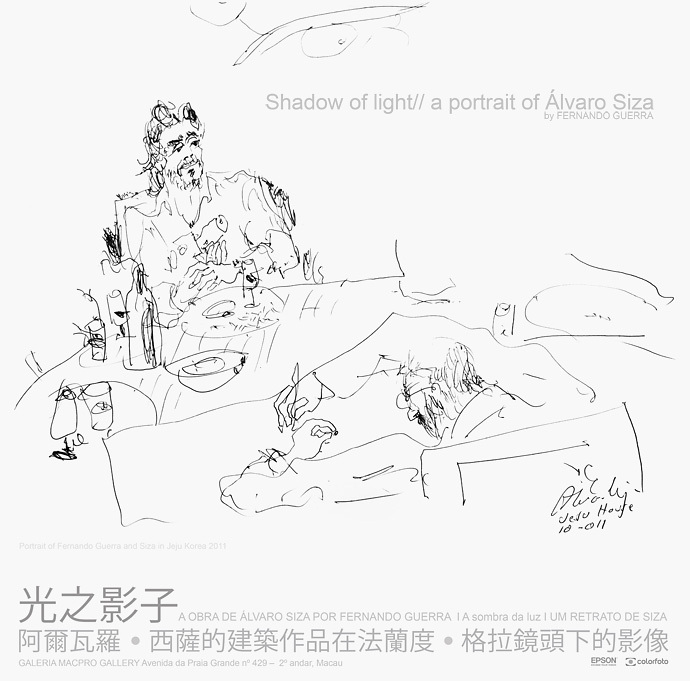 At the end of their trip, the trio visited the “Shadow of light – a portrait of Álvaro Siza” exhibition opening and vernissage, in Macau, realized by Fernando Guerra. 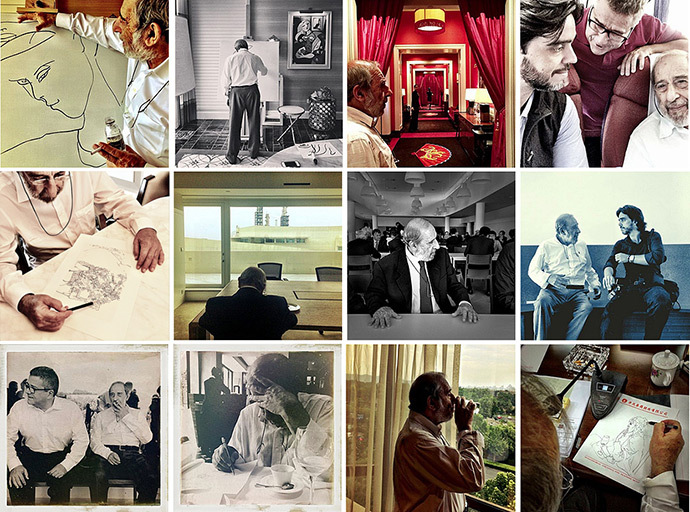 We were able to follow this intimate journey through the images taken by Guerra and published every day in his Instagram – a careful, spontaneous and delicate photographic narrative that shows a little bit of what were these weeks with Siza and Castanheira were like. Back in Portugal, Fernando Guerra published an interesting report on those last weeks and generously shared with us both his writings and his beautiful pictures." O que ambos anseiam é dominá-la, controlá-la, manipulá-la. Nessa procura criam sombras, volumes, espaços, perspectivas, ambientes, profundidades, detalhes. Realidades quase irreais de beleza, de conforto, de harmonia. Em ambos há intranquilidade na procura e a vontade de fazer melhor. Sempre. Retratam-se, mutuamente, no espaço e no tempo, tornando-se intemporais. Álvaro Siza e Fernando Guerra trabalham a luz. Sem ela o trabalho de ambos não tem significado, objectivo, razão. What they both yearn for is to dominate it, control it, manipulate it. In their search they make shadows, volumes, spaces, perspectives, environments, depths, details. Realities that are almost unreal in their beauty, comfort and harmony. Both of them are unsettled by their pursuit and desire to do better. Always. They both portray themselves, in space and time, and have become timeless. 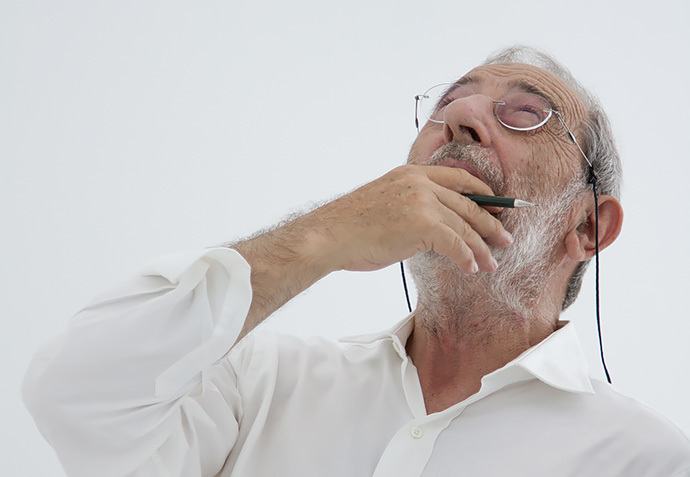 Álvaro Siza and Fernando Guerra work with light. Without light the work of either is without meaning objective or reason. 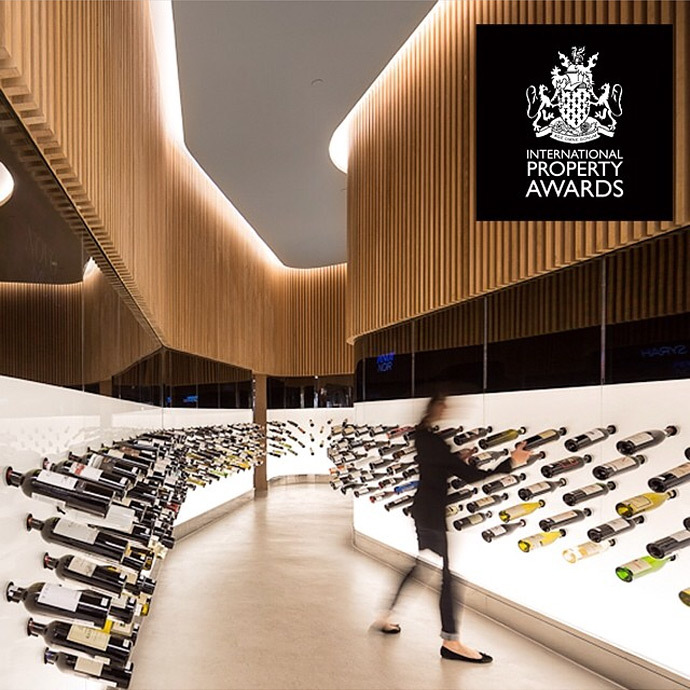 A Loja de vinhos Mistral do Studio Arthur Casas, fotografada em 2012 por Fernando Guerra é a vencedora do International Property Awards 2014-2015 na categoria Retail Interior. "Na Ilha do Fogo, a 1800 m de altitude, dentro da cratera do vulcão, está fixada uma povoação com cerca de 1200 pessoas, à margem da legalidade, ocupando terrenos do Estado, onde organizam as suas actividades principalmente agrícolas, garantido a sua sobrevivência numa das mais pobres zonas de Cabo Verde. O estatuto de área protegida de interesse nacional forçou a delimitação de zonas de cultivo, com limites de construção e introdução de normas, contrariando a ocupação livre da povoação, gerando colisões de vontades e interesses com confrontos frequentes. O Projecto da Sede do Parque Natural do Fogo, nasce das necessidades da consolidação da identidade de uma área protegida e da conciliação da povoação com a nova gestão do Parque. Assim, foram concebidos e criados espaços de lazer e culturais para usufruto tanto dos habitantes de Chã das Caldeiras como de visitantes; espaços de trabalho também foram criados para a fixação de técnicos ligados à gestão e tratamento da área protegida. A paisagem natural, muito marcada pelo vulcão e cratera, é de uma beleza única e rara, com potencial para vir a alcançar estatuto de património mundial. Neste contexto, a ideia base passou por projectar um edifício de modo a ser parte da paisagem e a paisagem ser parte do edifício, havendo como que uma fusão de peles escuras. De dia os muros compridos desenham o edifício e cozem-se com a estrada criando um labirinto e jogos de sombra. De noite qualquer luz é demasiada, pelo que para proteção das aves autóctones, toda a iluminação é indireta. Os desafios da escassez de recursos locais tornaram-se em oportunidades e, desta forma, o edifício foi feito pela população e para a população, utilizando técnicas e materiais locais. Para colmatar a não existência de qualquer rede pública, o edifício tem a autonomia energética garantida com energia solar e a rede de águas é dupla, aproveitando a água das coberturas e as águas da utilização diária complementada com grandes depósitos, abastecidos anualmente com recurso à pluviosidade. 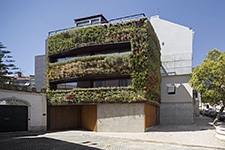 Todo o edifício é envolvido por rampas e espaços com espécies vegetais representativas do parque natural que se estendem para o exterior do edifício, fundindo-o com a envolvente. O edifício é dividido em duas zonas; Zona cultural composta por auditório coberto, auditório aberto, biblioteca e bar esplanada; Zona Administrativa composta por salas de reuniões, salas de trabalho, laboratório e áreas técnicas. Com a sede em funcionamento, está valorizado o Parque Natural do Fogo, acrescentando algo mais aos tecidos social, cultural e económico da Ilha, passando a integrar e a valorizar de uma forma harmoniosa todo o espaço envolvente; a sede é para ser sentida como uma nôs cása nas terras de Djarfogo". 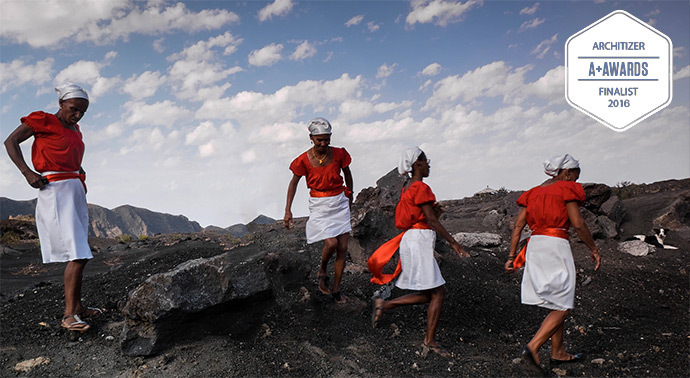 "On Fogo Island, at 1800 meters of altitude, in the crater of the volcano, there is a village with about 1200 people living on the fringes of legality, occupying lands of the state where they organize mainly agricultural activities, ensuring their survival in one of the poorest areas of Cape Verde. The status of protected area of national interest forced the zoning of farming, with limitation to construction, and introduced rules against the free occupation of the town, generating collisions of interests with frequent clashes. The Project of the Headquarters of Fogo’s Natural Park was born from the need to consolidate the identity of a protected area and to conciliate the population with the new park management. Accordingly, we designed and created spaces for cultural and recreational enjoyment for both residents of Chã das Caldeiras as for visitors; Workspaces were also created for employing technicians that will be responsible for the management and treatment of the protected area. The natural landscape, deeply marked by the volcano and its crater, is a unique and rare beauty, with the potential to become a world heritage site. In this context, the basic idea was to design a building so as to be part of the landscape and the landscape being part of the building, and to have sort of a melting of darker skins. During daytime, the long walls shape the building and blend with the road creating a maze and a mix of shadows. At night, bright light is avoided, so to protect the native birds, all lighting is indirect. The challenges of shortage of local resources became an opportunity and, therefore, the building was made by the people and for the people, using local materials and techniques. To address the lack of any public utility grids, the building has a guaranteed energy independence with solar energy as the main source and a double water grid; water is taken from the roofs and daily used water supplemented with large deposits, stocked annually after the rainy season. The whole building is surrounded by ramps and spaces with representative plant species of the natural park extending to the exterior of the building and merging it with the surroundings. The building is divided into two zones: Cultural Zone - composed of a covered auditorium, an open auditorium, library and terrace bar; Administrative Zone - comprises meeting rooms, offices, laboratory and technical areas. With the Headquarter fully operational, the Natural Park is increasingly valued, which contributes to enrich the social, cultural and economic sectors of the island, starting to integrate and enhance in a harmonious way the surrounding space. The head office is to be felt as nôs cása in the land of Djarfogo". 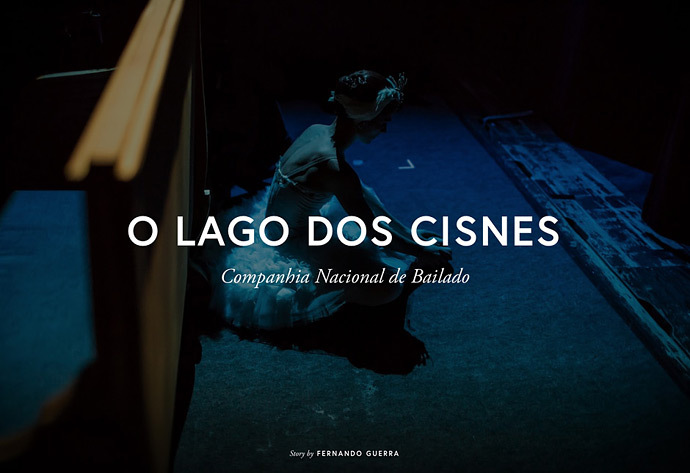 A Companhia Nacional de Bailado apresenta nesta temporada uma curta série de espectáculos de ‘O LAGO DOS CISNES‘ uma nova produção estreada no ano passado e que conta com os figurinos assinados por JOSÉ ANTÓNIO TENENTE. 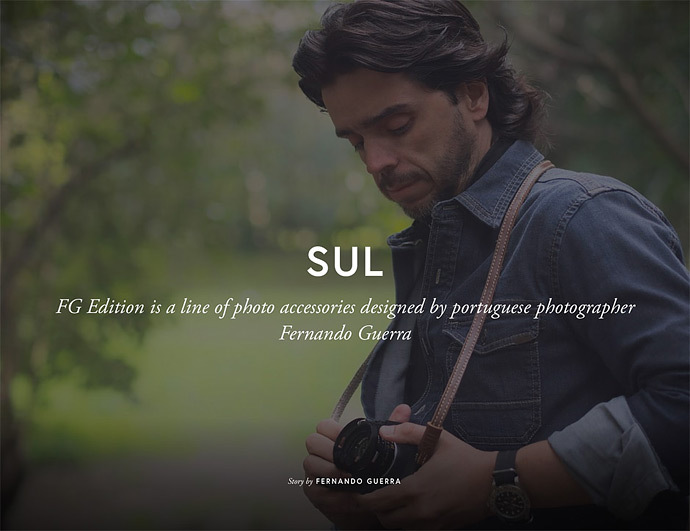 FG Edition é uma linha de acessórios de fotografia desenhada pelo fotógrafo português Fernando Guerra. "Privilegiamos a simplicidade e perfeição. As nossas alças resistem ao tempo e ao peso da sua máquina fotográfica. São executadas à mão, por artesãos, em edições limitadas, numa pequena aldeia perto de Lisboa. Alças que envelhecem desgastando-se nas suas viagens, marcadas pelo toque das mãos, pescoço, suor e sol. Acompanham-no no registo de momentos únicos, gravados, não como pixéis, mas como tatuagens sobre a pele. Alguns modelos podem apresentar irregularidades, imperfeições e cicatrizes na pele, próprias de um curtimento sem tratamento." 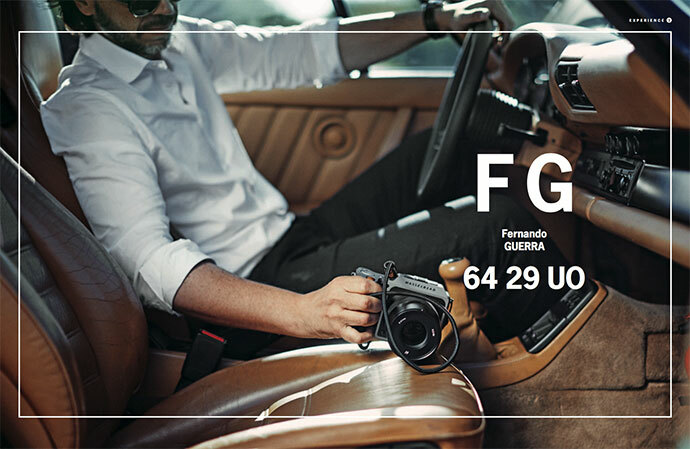 FG Edition is a line of photo accessories designed by portuguese photographer Fernando Guerra. "We favour simplicity and perfection. 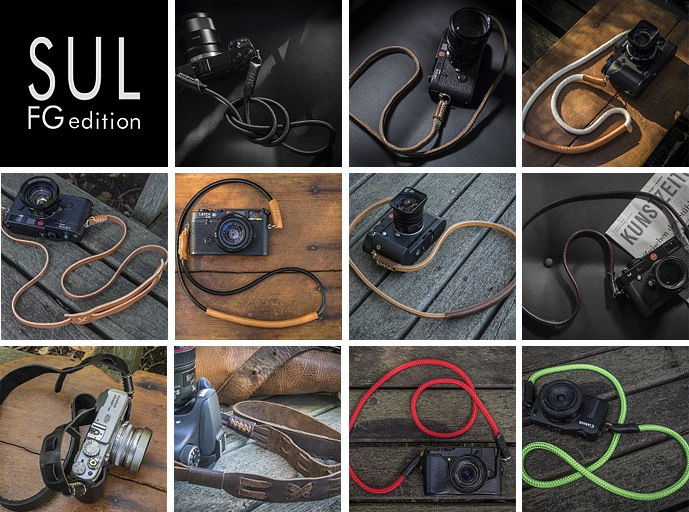 We make straps that endure the test of time and the weight of the camera. They are manufactured in limited editions in a small village near Lisbon using leathers that truly inspire us. Leather that ages along with your travels and becomes worn and marked with the repetitive touch of hands, neck, sweat and sun. Along with your camera, they keep you company, collecting moments, recorded not as pixels but as tattoos on its skin. Simple straps, inspired and designed by a renowned photographer. And called FG Edition. Because we only use natural leather, it might have minor color or shape irregularities in the same strap. We call it, history." 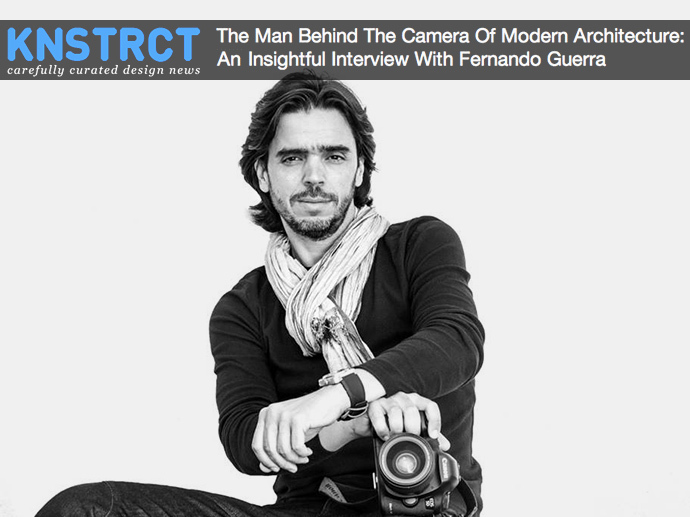 I do not want to call it an interview - it was a fabulous discussion that Fernando Guerra led as a loose narrative with notes on work that he practices with hedonism and filled with life. They are all stories dedicated to the great beauty of doing what one loves and letting it grow. In the São Paulo neighbourhood of Morumbi, this family home efortlessly blends indoors and outdoors in characteristic Brazilian style. 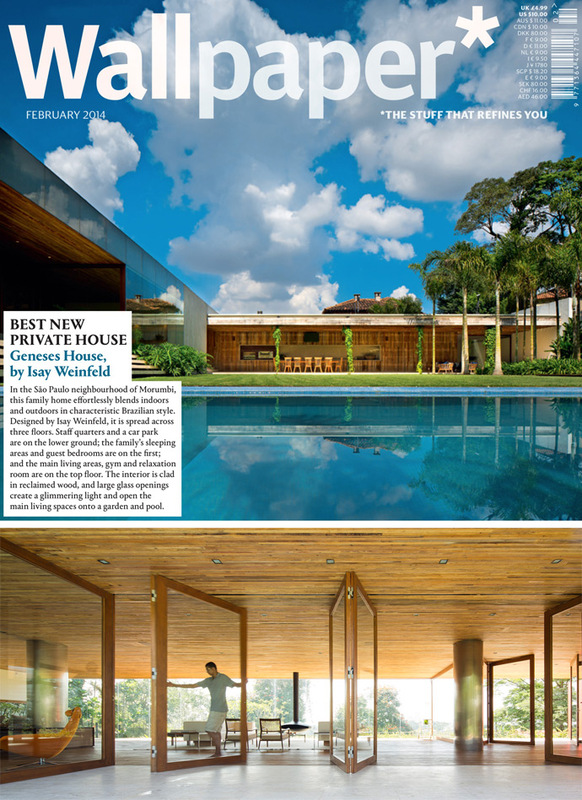 Designed by Isay Weinfeld, it is spread across three foors. Staf quarters and a car park are on the lower ground; the family’s sleeping areas and guest bedrooms are on the frst; and the main living areas, gym and relaxation room are on the top foor. The interior is clad in reclaimed wood, and large glass openings create a glimmering light and open the main living spaces onto a garden and pool. Portuguese Contemporary Houses é a mais recente edição da Uzina Books que representa 231 casas da melhor arquitectura feita em Portugal nos últimos 15 anos, das quais 111 projectos fotografados por Fernando Guerra. O cubo, metáfora de arquitectura, é desconstruído, revelando a jóia no seu interior. Primeira edição de uma série exclusiva que pretende divulgar a arquitectura portuguesa. Disponível na Livraria A+A. 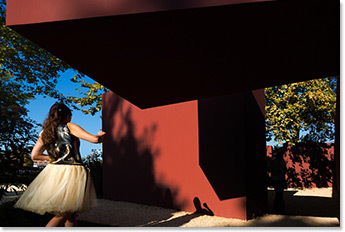 As a metaphor for architecture, the cube is deconstructed, disclosing the jewel within. 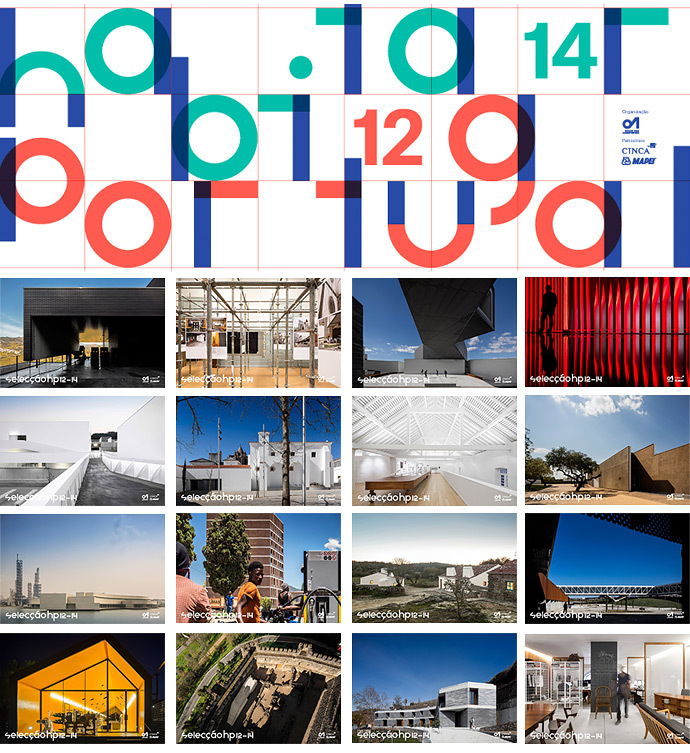 First edition of a series, that proposes to reveal and promote portuguese architecture. Available at Livraria A+A. Como vem sendo habitual no final de cada ano, lançamos uma nova série de impressões que disponibilizamos aos nossos clientes e ao público em geral. 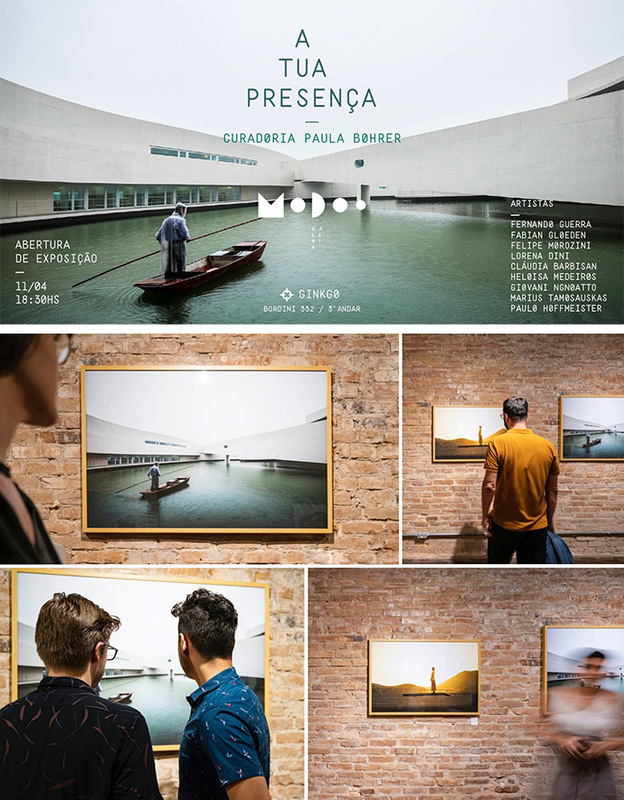 Esta nova série que tem a particularidade de ter dimensões mais reduzidas e um valor de aquisição mais acessível, é lançada para já com três fotografias que estarão disponíveis na Livraria A+A da Ordem dos Arquitectos e por encomenda directa no nosso site. Uma tiragem limitada de 30 provas assinadas e carimbadas com o selo de qualidade Digigraphie. 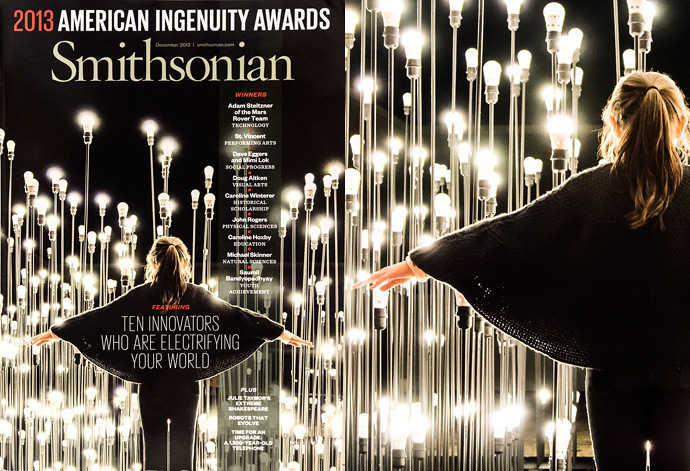 Smithsonian Magazine featured one of Fernando photographs of the light bulb installation by LIKE architects in Lisbon as the cover for the December 2013 issue. Is a special issue where we announce our "Ingenuity Award" winners. The awards are given to people who have made significant accomplishments in the arts, history, technology, science, and social research. 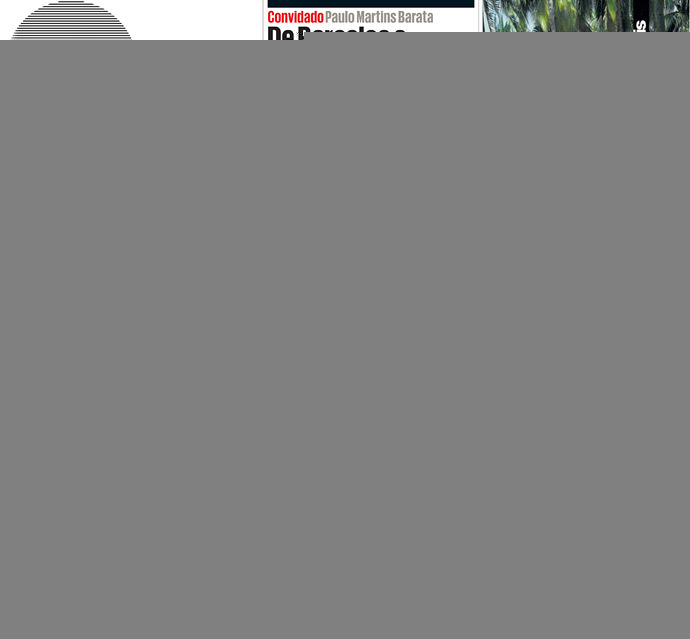 Smithsonian Magazine has a readership of two million, and features articles by world-class writers and photographers on travel, history, natural history, art and science. It is affiliated with the Smithsonian Institution in Washington, DC. "Quando penso em objectos marcantes, penso primeiro nas máquinas fotográficas que me acompanham há anos e das quais nunca me desfiz. Cada uma tem a sua história e ligação a momentos, viagens e fotografias especiais. É difícil escolher uma, e por isso nunca o faço. Como qualquer fotógrafo de arquitectura vivo quase permanentemente na estrada, entre trabalhos. Quase sempre sozinho e quase sempre... a conduzir o meu carro. Para além do meu trabalho diário de visitar, fotografar e divulgar a arquitectura, gosto de ocupar o tempo que me sobra a restaurar, a cuidar de um carro antigo, arranjar peças e inventar outras. Motivo pelo qual, a par das máquinas fotográficas, os automóveis estão sempre presentes. Os que me acompanham nas minhas viagens de trabalho ou passeio. Ou aqueles que irão acompanhar-me quando terminar o seu geralmente longo restauro. Escolhi por isso o velocímetro de um dos carros que mais gosto. Pela relação que sempre tive com este tipo de peças que, quase sem dar por isso, fui coleccionando, sem que necessariamente estivessem instalados no carro a que pertenciam e sobretudo pela paixão que tenho por este carro. Os velocímetros são peças singulares, pela sua ligação à década em que foram desenhados, e pela sua completa inutilidade quando desligadas de um automóvel. São como relógios que não funcionam, mas são para mim repletos de sentido por os associar ao prazer de os ver funcionar como parte de uma máquina maior. A minha vida está sempre repleta de pessoas que lhe dão sentido mas, muitas vezes, são as máquinas que me rodeiam que funcionam como o convite ideal para a fuga. Seja a fotografar ou a guiar, esteja sozinho ou acompanhado. Por tudo isto, a minha escolha tinha de ser uma máquina... Ainda que não seja aquela que mais se espera..."
"When I think of remarkable objects, I first think about the cameras that I've had for years and never disposed of. Each one has its own history and connection to special moments, trips and photographs. It is hard to pick one over the others, so I never do. Just like any photographer of architecture, between jobs I live almost permanently on the road: almost always alone and almost always... driving my car. Besides my day-to-day job of visiting, photographing, and promoting architecture, I enjoy spending the time I have leftover restoring and caring for an antique car, arranging parts and making others. This is the reason why, besides a couple of cameras, I am always surrounded by cars. The ones that accompany me on my travels for business or leisure. Or the ones that will accompany me when their generally long restoration is complete. For this reason, I chose the speedometer of one of the cars I like most. I chose it for the relationship I've always had with this type of car part that, almost without realizing it, I'd been collecting, and which isn't necessarily installed in the car it belongs to. But above all, I chose it because of the passion I have for this car. Speedometers are unique pieces, due to their connection to the decade in which they were designed, and their complete uselessness when disconnected from a car. They're like broken watches but are full of meaning to me because I associate them with the pleasure of seeing them work as part of a larger machine. My life is always full of people who give it meaning, but often it is the machines around me which function as the ideal invitations to escape. Whether it's shooting photographs or driving, on my own or with someone. For all these reasons, my choice had to be a machine... although not the one most expected of me..."
A presente edição Habitar Portugal 2009 / 2011, iniciativa do Conselho Directivo Nacional da Ordem dos Arquitectos apresenta uma selecção de obras construídas por arquitectos portugueses, entre 2009 e 2011, em território nacional ou estrangeiro. This is an unprecedented movement of solidarity and generosity where architects, draughtsman, designers and architectural and urban photographers come together from around 15 nations. Approximately 100 original pieces will be auctioned on October 16. The Pavillon de l’Arsenal will display these pieces the weekend before on over 600 m2, giving visitors a rare insight into the conceptual process of some of the greatest architects via sketches, drawings, aquarelle paintings, photomontages, furniture and prototypes. The exhibition also holds one of the largest urban photography collections ever assembled. 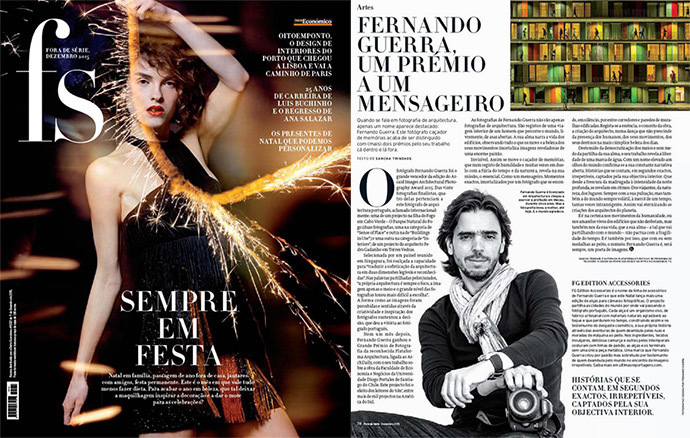 While Fernando is on the road, our team in Lisbon is busy working with editors from all the leading magazines, to make sure that your work gets to the biggest audience possible. We selected some of the most beautiful covers that we made on the last months. Pela segunda edição consecutiva o Prémio Nacional de Arquitectura em Madeira é atribuído a um projecto fotografado por Fernando Guerra. A distinção foi atribuída a COMOCO arquitectos (Luís Miguel Correia, Nelson Mota, Susana Constantino) pelo projecto N10-II Indoor. A edição de 2011 distinguiu Carlos Castanheira com o projecto Casa no Gerês igualmente fotografado por Fernando Guerra. O projecto para o N10-II Indoor tinha como propósito instalar um novo equipamento de apoio aos campos de futebol indoor em duas das três naves de um armazém de materiais de construção desactivado, localizado na zona industrial a norte de Coimbra (Eiras). O sistema construtivo define a materialização do volume. Uma estrutura porticada, construída com elementos de pinho americano, assinala a estrutura principal. O preenchimento desta grelha, tanto na cobertura como nas paredes, é efectuado através do uso de placas de MDF, com dimensões sistematizadas e aplicadas de forma a assumirem tanto estruturalmente como formalmente a definição da construção. O uso do MDF com acabamento natural relaciona-se com as outras opções de materialização, como o uso de azulejos brancos 10x10 na área dos balneários e com o desenho das peças de mobiliário em pinho e placas de MDF lacado a preto. The infill of this structure, both in the roof as in the walls, is made through the use of MDF boards, assembled in such a way as to perform both structural and formal roles in the overall construction. The raw use of the MDF boards is followed by a straightforward use of white ceramic tiles in the changing rooms and showers, and by the design of the furniture components, which are also made of raw pine wood elements and black lacquered MDF panels. Continuam a ser arquitetos, mas deixaram de projetar para passar a fotografar. Alguns dos maiores nomes da arquitetura, como Siza Vieira ou Zara Hadid, já não passam sem as imagens de Fernando Guerra tira e Sérgio Guerra vende para o mundo inteiro e são publicadas em revistas da especialidade. Na véspera do Dia Mundial da Arquitetura, uma história de sucesso em português. Herdaram do pai o gosto pela arquitetura. Com ele, Fernando e Sérgio Guerra aprenderam a dar valor ao espaço e à forma e a decifrar a verdadeira essência da obra. Cresceram entre esquissos e maquetes de edifícios, e o inevitável aconteceu: os filhos do arquiteto seguiram a profissão do pai. Mas há 15 anos dispararam o flash que lhes mudou a vida. Trocaram os estiradores pela câmara fotográfica para registar obras de sonho e edifícios emblemáticos, em imagens que correm mundo. Hoje, os irmãos Guerra então entre os mais requisitados fotógrafos de arquitetura do mundo. Na qualidade de media martner da Trienal de Arquitectura de Lisboa, temos o prazer de convidar para a semana inaugural da sua 3ª edição: Close, Closer. Uma investigação sobre o campo em expansão que é a prática arquitetónica contemporânea. As media partner of the Lisbon Architecture Trienal, it's our pleasure to invite you to the opening of the third edition: Close, Closer. An investigation into the expanding field of architecture practice today. Obras de arquitetos como Álvaro Siza, Eduardo Souto de Moura ou Fernando Távora serão exibidas no Museu de Arquitetura e Design Triennale di Milano, em Itália, entre 13 de setembro e 27 de outubro de 2013, no âmbito da exposição Porto Poetic, apoiada pelo Camões, IP. 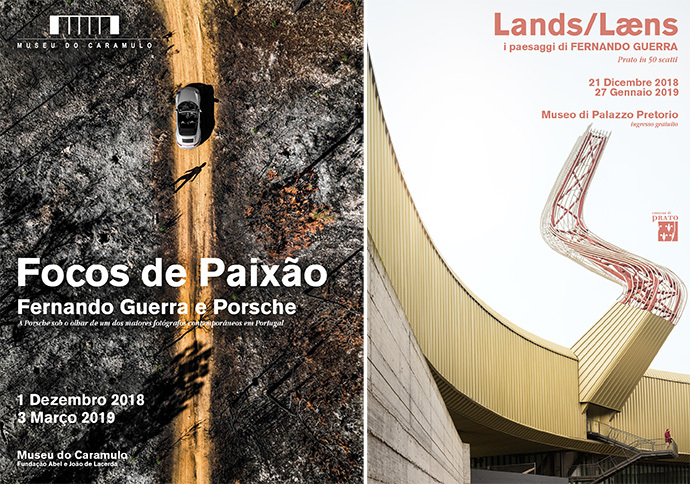 A exposição tem como principal objetivo “apoiar a internacionalização e a divulgação de obras de arquitetura de arquitetos portugueses da região norte do país, que incluem no seu método projetual o desenho de objetos e mobiliário que complementam a obra”, de acordo com a organização. 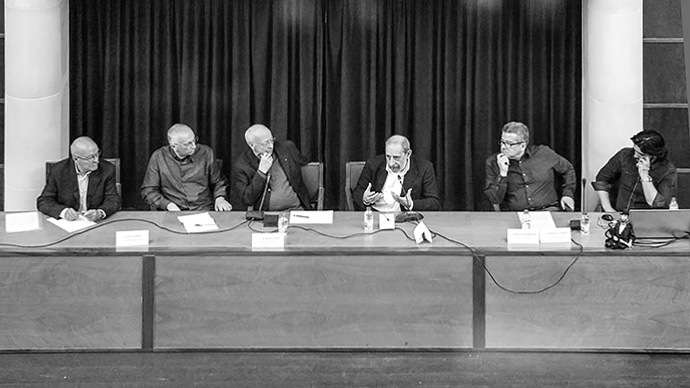 Assim, serão apresentadas obras de Álvaro Siza, Eduardo Souto de Moura, Fernando Távora, Adalberto Dias, Camilo Rebelo e Tiago Pimentel, Carlos Castanheira, Francisco Vieira de Campos, Isabel Furtado e João Pedro Serôdio, João Mendes Ribeiro, José Carvalho Araújo e Nuno Brandão Costa. A inauguração da mostra será assinalada com uma conferência/debate, no dia 12 de setembro, às 17h00, no Museu Triennale di Milano, com a participação de Álvaro Siza, Eduardo Souto de Moura, Vittorio Gregotti, Pierluigi Nicolin, Francesco dal Co e Giovanna Borasi (moderadora). Promovida pela Ordem dos Arquitetos da Secção Regional Norte (OASRN), a exposição realiza-se em colaboração com a Fondazione La Triennale di Milano, e em parceria com a Associação das Indústrias de Madeira e Mobiliário de Portugal (AIMMP). Os arquitetos Manuel Maria Reis e Paula Santos são responsáveis pelo comissariado, ficando a curadoria a cargo do também arquiteto Roberto Cremascoli. 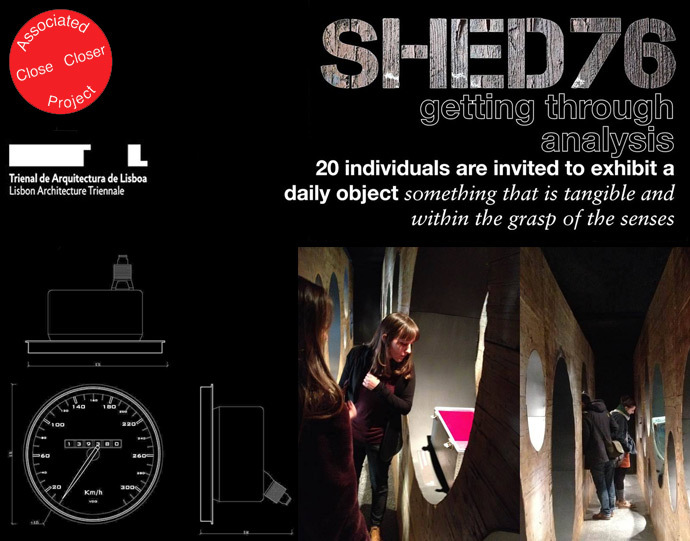 Esta iniciativa surge no seguimento da exposição “O Design por Arquitetos”, apresentada em 2012 no contexto da Feira Internacional do Porto – Exponor, e prevê-se que o projeto possa ser itinerante a Portugal e a outros países, de acordo com a OASRN. A Porto Poetic conta com o apoio institucional da Embaixada de Portugal em Roma, do Camões - Instituto da Cooperação e da Língua, e da Agência para o Investimento e Comércio Externo de Portugal (AICEP), contando ainda com o patrocínio da AXA, e com o apoio de diversas entidades e empresas. The construction of the Mimesis Art Museum, designed by Portuguese architect Álvaro Siza, was completed in 2009. 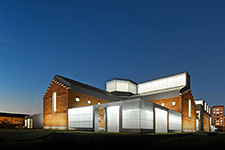 It was built to function first and foremost as an art museum. 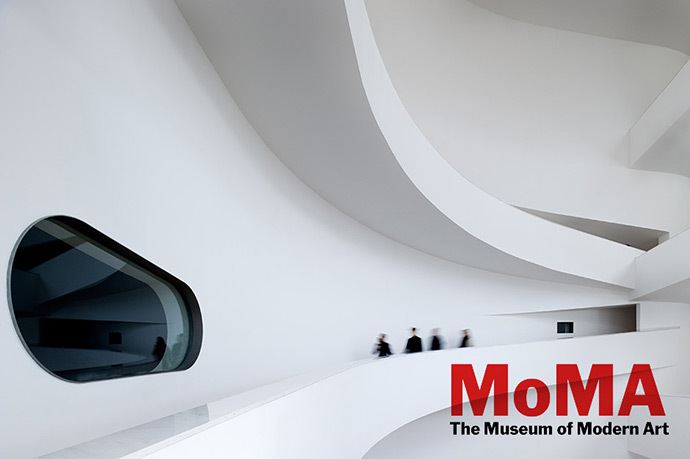 Therefore, the museum is lit by natural light rather than electric lights to make people focus more intently on the artwork. This beautiful architectural achievement is located in Paju Book City near Seoul, a new town dedicated to 21st Century publishing and architecture. The building was built jointly by Álvaro Siza, Carlos Castanheira and Korean architect Kim June-song. With three floors, a basement and a total area of more than 3,600 square meters, the Mimesis Art Museum offers an expansive exhibition space as well as administrative and office areas on the mezzanine. On the inside, white and wooded surfaces are lit by indirect, natural lighting. On the outside, light grey, exposed cast concrete emphasizes the feline curves and sharp angles of the building. The beauty and purity of its design and its cultural function make it an outstanding landmark among the many fine pieces of contemporary architecture that populate Paju Book City. Acabado de chegar da Coreia do Sul, o novo livro que fizemos com Álvaro Siza. 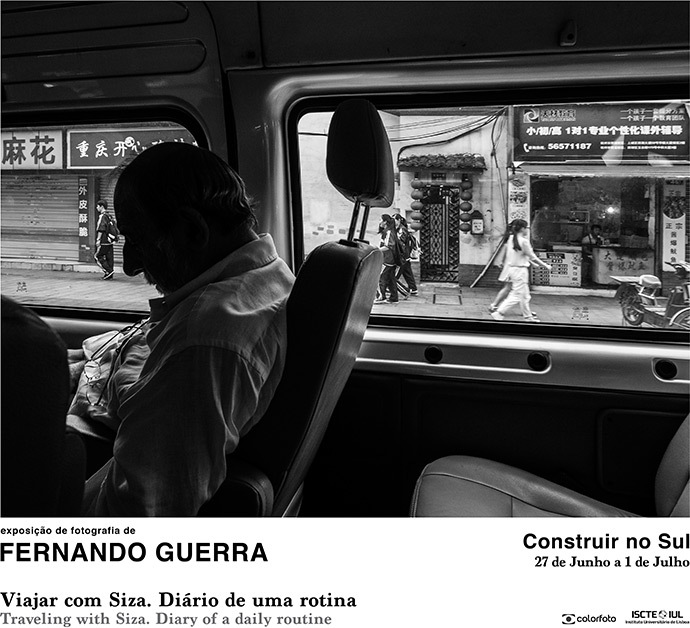 Durante os últimos 8 anos, Fernando Guerra já fotografou para mais de quinze livros sobre o seu trabalho. Esta última obra documenta com textos de vários autores, desenhos e fotografias, o longo processo de desenho e construção, do centro de R&D da Amore Pacific em Seoul. 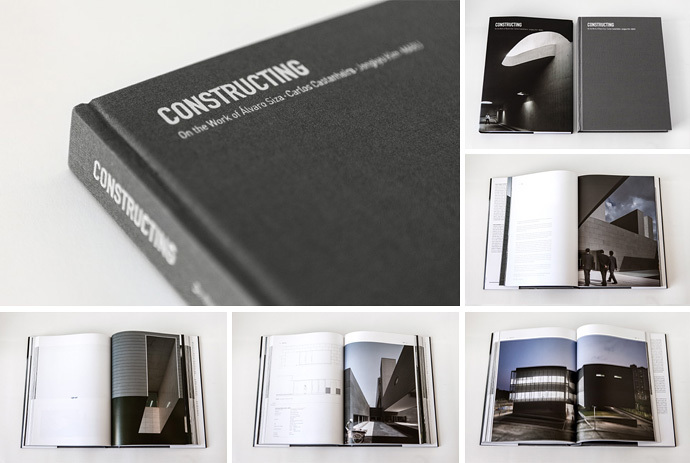 Just arrived from South Korea, the new book we did with Alvaro Siza. During the last eight years, Fernando Guerra has photographed for over fifteen books on his work. 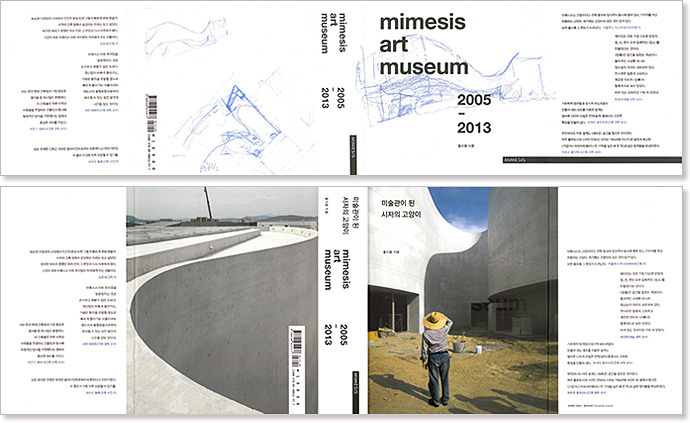 This last one documents with texts by various authors, drawings and photographs the long process of design and construction of the center of R&D Amore Pacific in Seoul. A TASCHEN lançou a compilação dos trabalhos de Álvaro Siza. Depois de há uns anos termos colaborado com a Phaidon, numa edição similar. Esta monografia com projetos e imagens novas, realizada em colaboração com o próprio Álvaro Siza, resulta num catálogo das suas obras até à data. De 1952 a 2013, é possível revisitar projectos marcantes como a casa na Coreia do Sul ou a Fundação Iberê Camargo no Brasil. 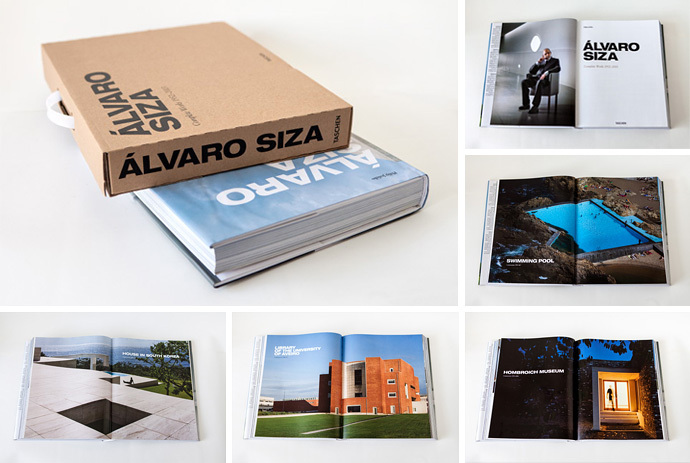 TASCHEN released the compilation of the work of Álvaro Siza. A few years after we had collaborated with Phaidon in a similar issue. This monograph with new projects and pictures held in collaboration with Alvaro Siza himself, resulting in a catalog of his works to date. From 1952 to 2013, it is possible to revisit notable projects as the House in South Korea or Iber Camargo Foundation in Brazil. 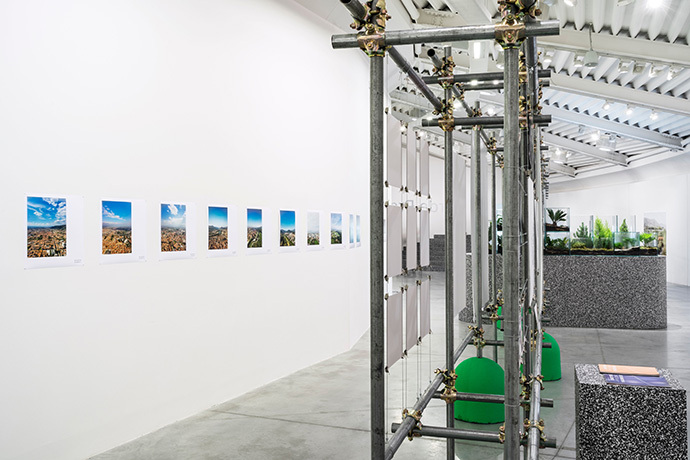 The exhibition displays, side by side, three specific photographic studies in which architecture is directly or indirectly present as a theme, as a reflection of certain social phenomena. 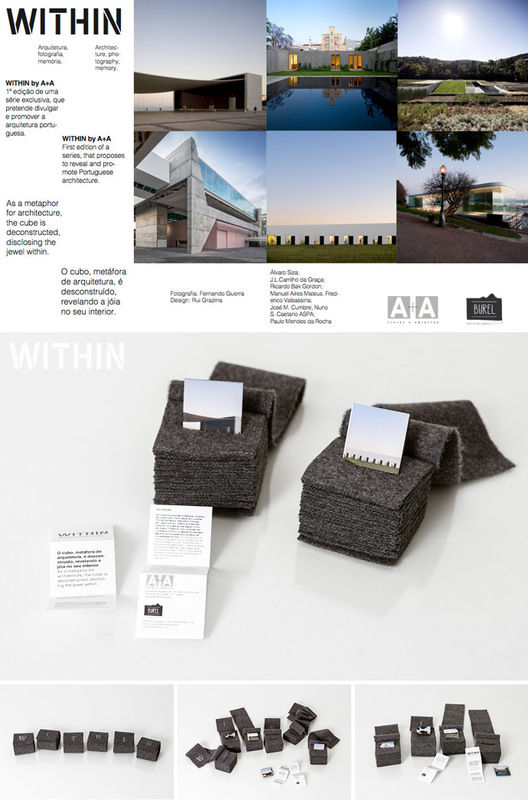 The photo series touched several topics concerning the relationship of architecture and photography: from curatorial questions about what kind of dialogue can exist between these two creative disciplines, to think about all situations where architecture recognize the problems of culture, economics and environment. 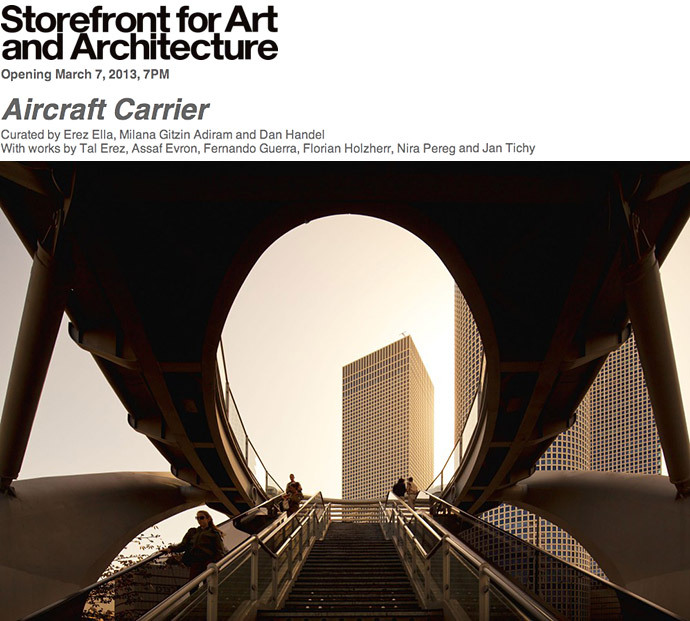 Aircraft Carrier surveys the period between two crises of capitalism, 1973 and 2008, to understand the radical change in Israeli architecture. The eventful year of 1973 marks a watershed in the workings of global capitalism, in the American strategic interest in the Middle East, and in Israel’s social, economic and political structures. Together, these elements, shaped by territorial struggles and energy crises, dramatically transformed Israeli architecture. The exhibition deals with this transformative period and with the American influences through which its innovations, and tragedies, were enabled. The exhibition is accompanied by a book, published by German publisher Hatje Cantz and edited by the curators, which contextualizes the phenomena in larger transformative processes. The book include Texts by Milton Friedman, Justin Fowler, and Eeva-Liisa Pelkonen and Visual works by participating artists and by Baltimore-based graphic designers Post Typography. For most of us, architecture is predominantly experienced from the ground, but there is something about the aerial view that fascinates. More often than not, it remains the privilege of high-rise living or part of the fun of flying, but it also reveals a rare way of experiencing design and one that shows architecture within its surroundings from a unique angle; be it a single building, a complex or a landscape. To bring you a new, elevated perspective, we've teamed up with portuguese photographer Fernando Guerra. He and his team have been experimenting with cameras attached to a lightweight, flying drone. For part one of a new series, we show you a selection of new and recent architecture projects in Portugal and beyond - all seen from air. Check back soon for the next instalment. We proudly announce the Archdaily Building of the Year Awards. 7 of the 30 finalists this year are projects from our clients photographed by Fernando Guerra, which is a big pleasure for us, achieving our goal of spreading architecture worlwide. 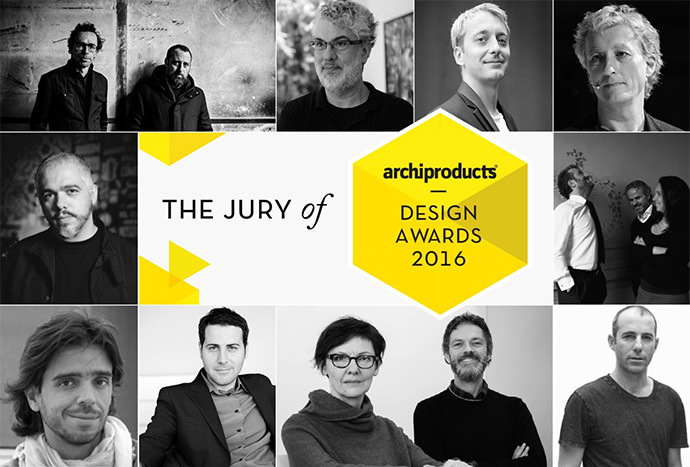 This award recognizes architects whose work has most impressed the community of ArchDaily readers over 2700 projects. Fernando Guerra has been behind a camera since he was 16 years old. His life has taken him on a considerable journey to document the most pivotal architecture of our generation. You might not know it, but you know his work. If you have seen the architecture of Álvaro Siza, Isay Weinfeld, Arthur Casas, or Zaha Hadid, then you have seen the photographs of Guerra. After working with Guerra for the past two years, publishing an array of his photographs on KNSTRCT, we thought it was time to hear the voice of such a monumental figure in the world of architecture. "Galaxy Soho constitutes a new office, retail and entertainment complex for the heart of this great Chinese city – matching its grand scale. The complex comprises five continuous flowing volumes, set apart yet fused or linked by a sequence of stretched bridges. Each volume adapts outwards, generating a panoramic architecture devoid of corners or abrupt transitions. Galaxy Soho reinvents the great interior courts of Chinese antiquity to create an internal world of continuous open spaces. Here, architecture no longer incorporates rigid blocks, but instead comprises volumes which coalesce to achieve continuous mutual adaptation and fluid movement between buildings. Shifting plateaus impact upon each other to generate a deep sense of immersion and envelopment, allowing visitors to discover intimate spaces as they move deeper in the building. The structure’s three lower levels contain retail and entertainment facilities, those above provide works spaces for innovative businesses of many kinds, while top levels are dedicated to bars, restaurants and cafes – many with views along the city’s great avenues". Depois de mais de um ano a desenvolver e adaptar equipamento que nos permitisse explorar a dimensão que nos faltava, chegou o momento de anunciar o novo serviço da FG+SG de recolha de imagens aéreas. Uma forma complementar de ver a arquitetura na paisagem, sem os custos associados de um avião ou helicóptero. Neste último ano modificámos várias máquinas fotográficas até encontrar a ideal para cada tipo de vôo, tendo experimentado paralelamante várias formas de as controlar remotamente. Redesenhámos o nosso drone e fabricámos novas peças. Experimentámos diversos motores e hélices até conseguir uma máquina que, por ser em fibra de carbono, é leve, robusta e com autonomia suficiente para nos garantir as condições de vôo ideais de forma a obter as imagens que o nosso cliente pretende. As fotografias são da autoria de Fernando Guerra que com a colaboração do nosso "piloto", o mais recente membro da nossa equipa, garantem o enquadramento e a qualidade desejáveis. Esta nova opção, ao possibilitar o registo de imagens do projecto visto do ar, seja ele um edifício, uma parte de cidade ou um campo de golf, permite complementar uma sessão tradicional com uma nova dimensão. Informações sobre este novo serviço no ultimasreportagens.com a biblioteca portuguesa de projetos de arquitetura. Agora com mais uma dimensão. After more than a year of developing and adapting equipment that would allow us to explore the missing dimension, it is time to announce FG+SG's new service of collecting aerial images, providing a complementary form for viewing architecture against the landscape without the associated costs of an aeroplane or helicopter. This past year we modified several cameras until we found the ideal match for every type of flying, having experimented in parallel various ways to control them remotely. We redesigned our drone and manufactured new parts. We experimented with different motors and propellers until we had a machine made of carbon fiber that is lightweight, robust and autonomous enough to guarantee optimal flying conditions in order to obtain the images that our clients want. 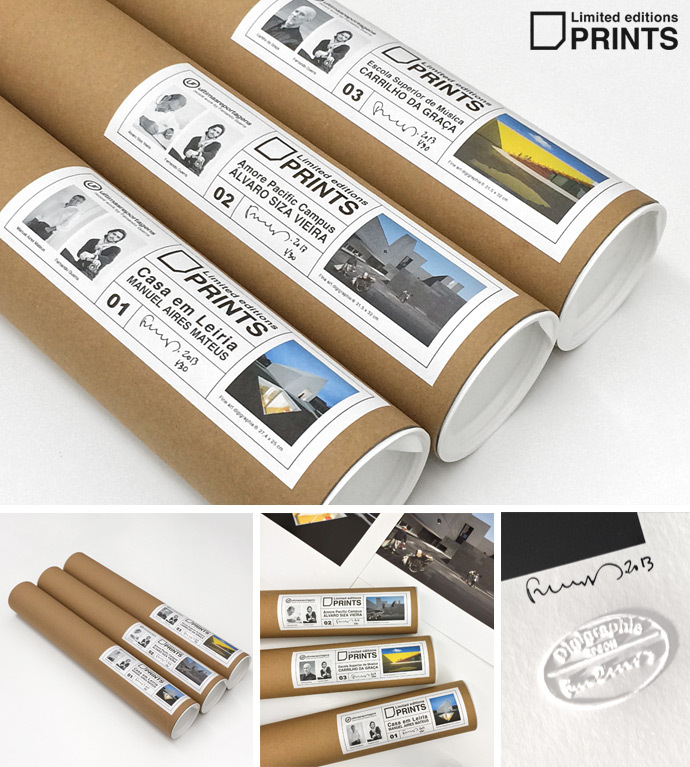 The photographs are by Fernando Guerra, who, together with the help of our "pilot", our newest team member, guarantees the desired framing and quality. In allowing project images to be taken from the air, be it of a building, part of a cityscape, or a golf course, this new option complements the traditional photo shoot with a new dimension. 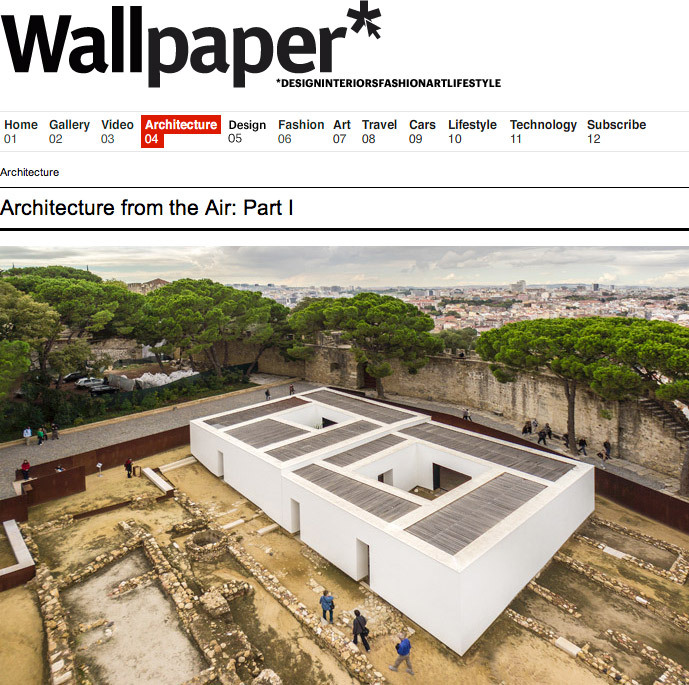 Information about this new service can be found at ultimasreportagens.com, the portuguese library for architectural projects. Arcaid Images is the world’s premier source of high quality architectural imagery. World Architecture Festival is the world’s largest festival and live awards competition dedicated to celebrating, and sharing architectural excellence from across the globe. Now in its fifth year, the World Architecture Festival has welcomed over 8000 attendees to date. WAF 2012 is the most packed World Architecture Festival date with more seminars, keynotes, crit presentations, learning and networking opportunities than ever before. 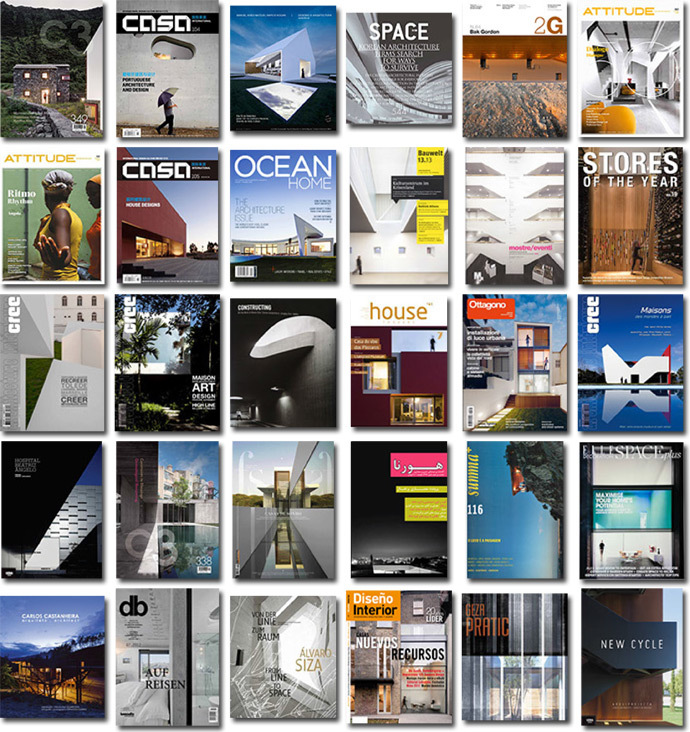 The Architectural Review is the only complete global architecture magazine, read and enjoyed in over 130 countries. 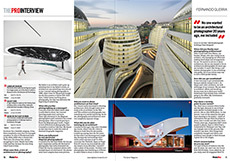 World renowned for its truly global and inspirational perspective, it is the one magazine in which architects aspire to have their work published. Being invited to be part of an event such as this in Venice on the recent history of a country such as Israel - a country I had never visited before nor had any connection to- was a very special opportunity. Not only because it was a unique trip that took me across the whole country, but also because it took me away from the routine of my daily reports, allowing me to participate on a different level as a artist invited to the 13th edition of the Venice Biennial in the Israeli pavilion called "Aircraft Carrier". The collected works on display confront the dramatic changes in Israeli architecture since 1973, and the American influences that made them possible. 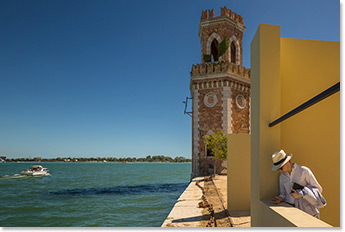 Venice, a city as beautiful as it is impractical, expensive and full of tourists, still preserves its natural charm, and this edition of the biennial has many reasons to make it worth a visit. The theme for this year's Biennale, chosen by its British director David Chipperfield, is 'Common Ground'. It's a choice that hints at architecture's need to refocus on issues like engagement and communication, and to establish shared values. 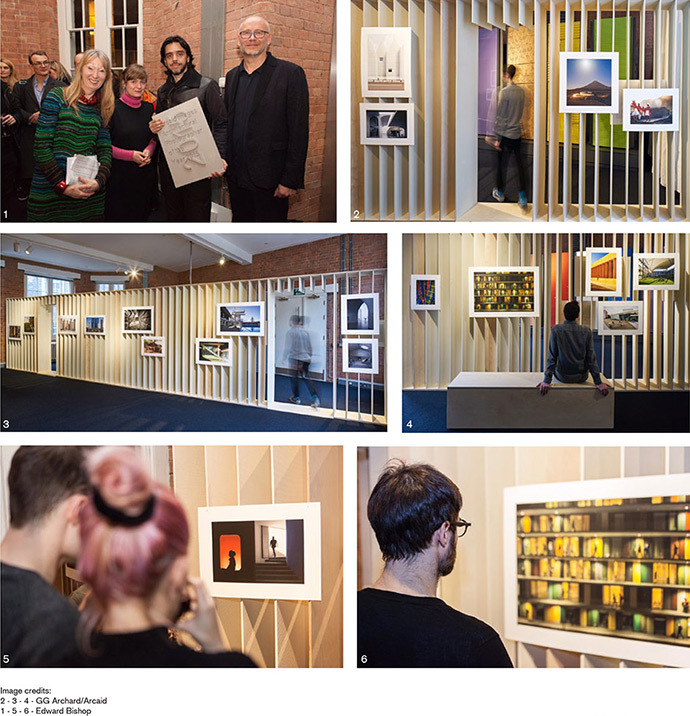 In the midst of so many exhibitions, book launches and awards ceremonies, personally the most important was the emphasis throughout the event on architectural photography. Not just as a mere illustrator of structures, but as its centerpiece. 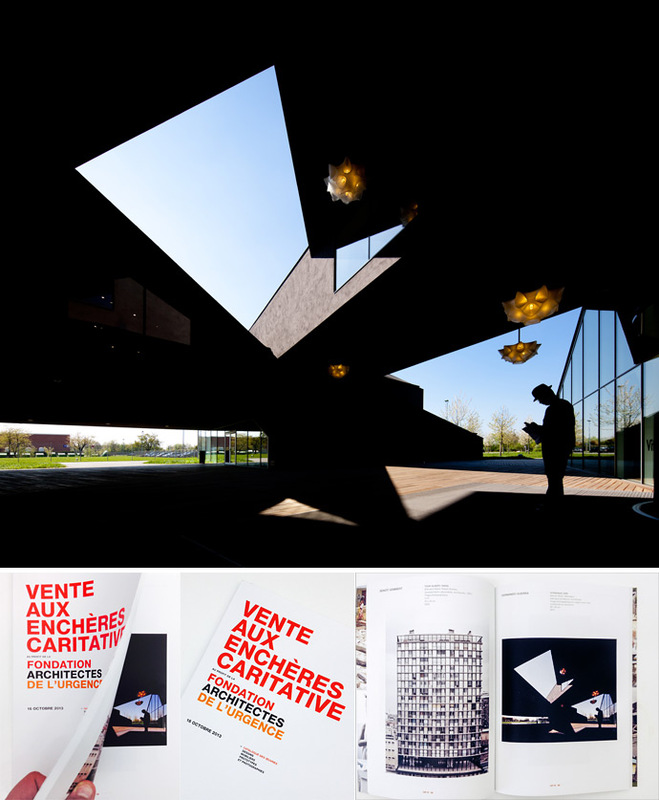 Several exhibits confirm the photographic image as the communicator par excellence of architecture. Only a visit to the actual site can beat it. Never before has so much been photographed, nor architecture so much discussed, and photography is increasingly fulfilling its relevant role in this communication process. This is important for all those whose make their living from it, such as Iwan Ban, Leonardo Finotti, and Cristobal Palma whom I had the opportunity to meet once again in Venice. Fellow architectural photographers whom I very much respect. We all photograph in different, often competing registers, but above all, we are friends, who reconnect through the structures photographed on the same day, or at events like this. Having been appointed Canon Explorer, assuming the role of ambassador for Canon Europe in terms of architectural photography, as well as all the collaborations launched in recent months with architectural offices in Brazil, Italy, Spain, France and China, have served to give us strength and contributed to counteracting the prevailing crisis in Portugal, and especially the dismay that it causes. I feel we are just starting our engines and that everything still remains to be done. And I write "we" because FG+SG are actually 5 people, and the work we do today is more demanding than ever and requires a totally committed team to communicate the best work in Portugal and worldwide every day of the week. Never have we had so much work or high levels of responsibility. Nor have I had as much pleasure in making photography my way of life as today. Here's to the next events, but above all here's to reconnecting with friends, may there be time for that. Here's to an autumn full of beautiful images. O canal norte americano HGTV a esta a realizar o programa Extreme Houses, sobre casas em Portugal fotografadas por Fernando Guerra. Álvaro Leite Siza, Aires Mateus, Marco Guarda e Nélson Resende são alguns dos arquitectos em destaque neste episódio filmado em Portugal nas últimas semanas. Canon Europe has announced the expansion of its Ambassadors Programme with the addition of a new tier of ‘Explorers’ that will see top class photographers from across Europe sharing their passion for the power of photography with a love of shooting with Canon equipment. The first 17 Explorers joining the Ambassadors Programme have been specially selected by Canon representatives from around Europe and come from a wide range of photographic and film making genres including wildlife, sports, fashion, photojournalism, travel, portrait and weddings. The Ambassadors Programme initiative is inspired by the ‘Explorers of Light’ scheme, which Canon USA has been running very successfully since 1996. Canon Europe’s Ambassadors Programme was launched in June 2008 with world-class photographers from a wide range of photographic disciplines – including news, sport, nature, fashion, advertising and portraiture – and from all corners of the world. 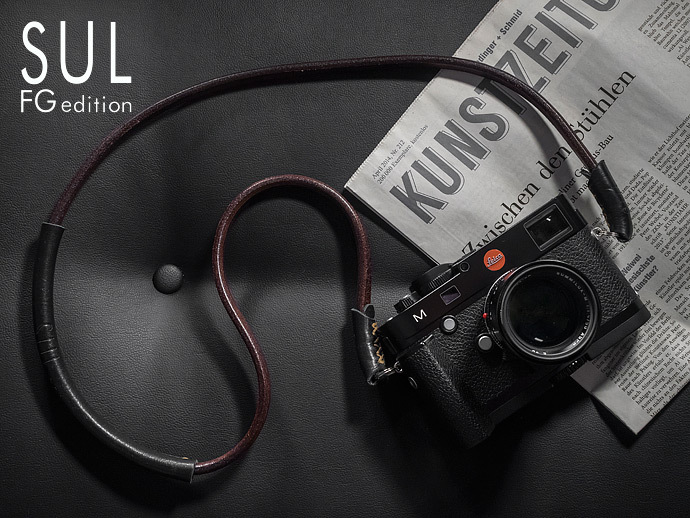 Over the past four years they have lent their expertise to workshops, seminars and major photography shows, including Visa Pour l’Image and Photokina, to create unique opportunities for photographers at all levels. The Ambassadors Programme is scheduled to expand further with many more top photographers from around the world, who use and enjoy shooting with Canon equipment every day, joining to share their photographic passions and technical expertise. In the near future a third tier will be added to the Ambassadors Programme with the addition of Canon ‘Masters’. The addition of the ‘Masters’ will open up the Ambassadors Programme even further to the wider photographic community by incorporating highly influential photographic industry professionals, as well as top, internationally renowned photographers who will provide their expert opinions for the Ambassadors Programme. To find out more about Canon Europe’s expanded Ambassadors Programme, and discover more about all of the Explorers who have already joined the scheme, just click here. 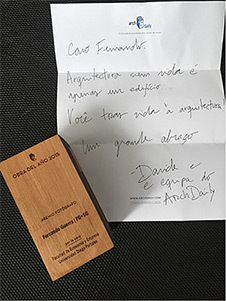 "Hoje a arquitectura é “interessante” na medida em que ela própria é um “marketing by-product.” Hoje, o que importa é comunicação pura ou anti-comunicação, que é uma forma de comunicar bastante mais sofisticada e igualmente eficaz. Ficar in loco parentis neste meio pode indiciar um perigoso estado de desespero. While on assignment for the "Aircraft Carrier"
A Canon reune uma vez mais um grupo dos mais destacados fotógrafos profissionais que inspiram e formam futuras gerações de fotógrafos e criativos. 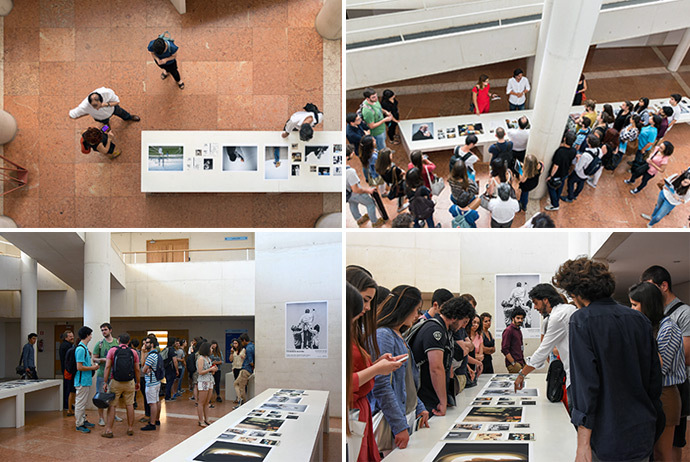 Este prestigiado grupo de cerca de 80 fotógrafos internacionais, conhecido como “Explorers of Light” elabora seminários, workshops, exposições e apresentações do seu trabalho em várias associações, grupos e faculdades. Representam diversas categorias e estilos que se estendem na vasta gama abrangente das expressões fotográficas. 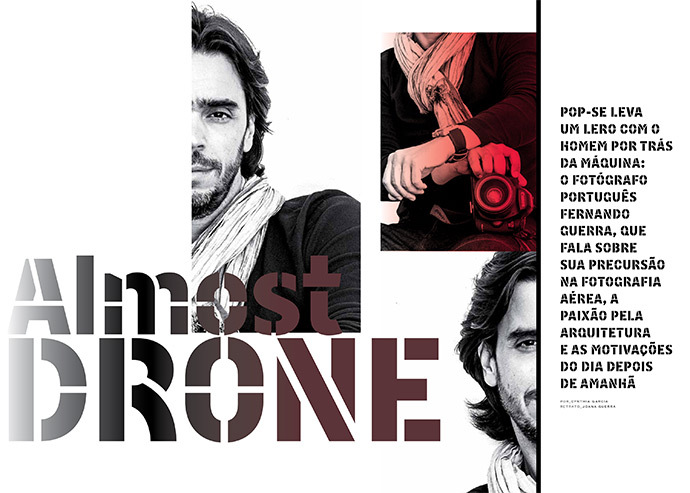 Fernando Guerra foi convidado a integrar este programa internacional de fotógrafos, tornando-se assim membro do mais recente grupo dos “Explorers of Light”. Canon has once again assembled a group of the world's leading professional photographers to provide insight, inspiration and education to future generations of creative photographers. Known as the “Explorers of Light," this prestigious panel of 80 Canon photographers delivers seminars, workshops, gallery showings and photo presentations at a variety of professional association and amateur photo groups and colleges across the country as a means of fostering imaging excellence and nurturing the increasingly digital art's next wave. Representing specialties and styles that span the gamut of photographic expression within the imaging profession. 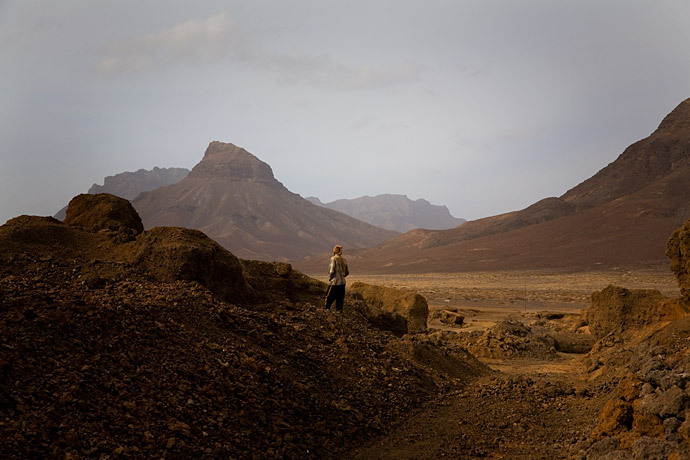 Fernando Guerra was invited by Canon to join this international programme of photographers, thus becoming a member of the "Explorers of Light" group. O programa Euromaxx da estação de televisão alemã DW, numa série de documentários dedicado às principals cidades europeias, à sua cultura, locais e figuras que se destacam, acompanhou Fernando Guerra por Lisboa ao longo de dois dias intensos, que pretendem mostrar em Lisboa alguns lugares de eleição, e ilustrar o quotidiano de Fernando durante as suas sessões de trabalho. In a series of documentaries highlighting the culture, places and figures of major European cities, the Euromaxx programme by the German television network DW accompanied Fernando Guerra around Lisbon for two intense days, with the intent of showing some of his favourite places, and depicting Fernando's daily life during his work sessions. Fernando Guerra foi convidado a participar na representação de Israel da 13º Bienal de Arquitectura de Veneza, comissariada por Erez Ella, Dan Handel and Milana Gitzin Adiram. 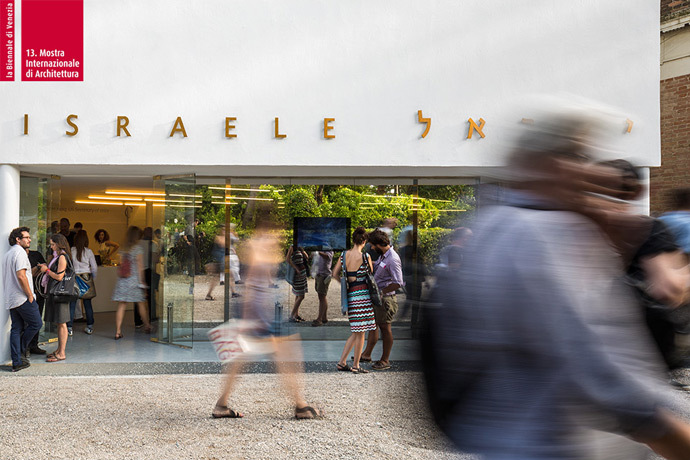 Fernando Guerra is going to participate at the Israeli representation at the 13th Venice Architecture Biennale, curated by Erez Ella, Dan Handel and Milana Gitzin Adiram. O Últimas Reportagens oferece agora a possibilidade de fazer a pesquisa indexada de projectos por arquitecto. Na barra lateral à direita encontra agora sempre disponível e em constante actualização uma lista de todos os arquitectos presentes na nossa base de dados, tornando-se assim ainda mais fácil encontrar todos os projectos de cada arquitecto apenas com um clique. Num esforço constante e sempre renovado para divulgar a arquitectura portuguesa e internacional, torna-se assim mais acessível e simples através desta pesquisa encontrar cada projecto na vasta lista de arquitectos que constitui a nossa biblioteca. Uma funcionalidade que privilegia quem pesquisa e em particular editores, revistas e publicações, e por outro lado os autores dos projectos ou arquitectos que passam a dispôr de um portfolio mais organizado e indexado a cada obra. 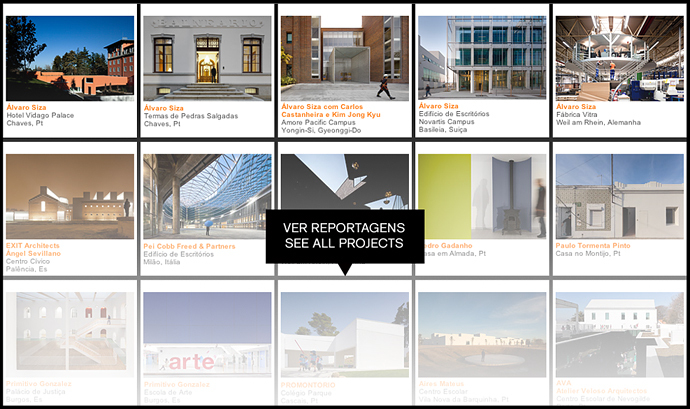 Últimas Reportagens now offers the possibility of carrying out an indexed search of projects by architect. The right sidebar contains a permanently available and constantly updated list of all the architects present in our database, making it even easier to find all projects by a given architect with a single click. 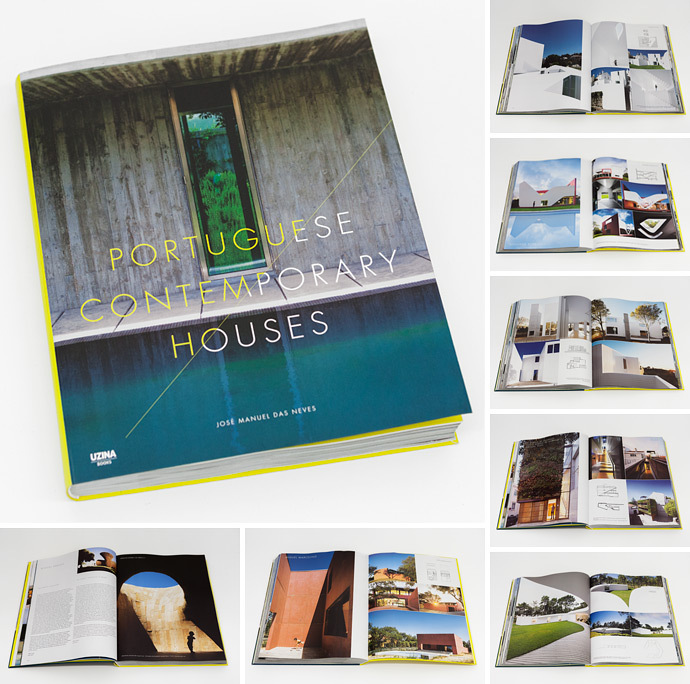 In a constant and renewed effort to publicize portuguese and international architecture, this search feature makes each project more accessible and easier to find among the extensive list of architects that constitutes our library. This feature benefits researchers and in particular editors, magazines, and other publications, as well as project authors and architects who will enjoy a more organized and indexed portfolio of each work. 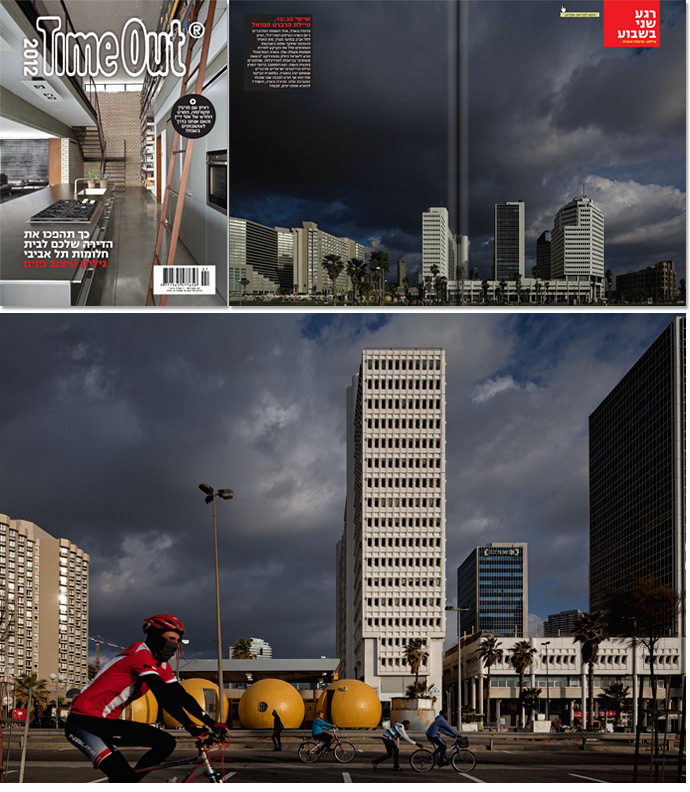 "Fernando Guerra, one of the most celebrated names in architectural photography today, arrived to Tel Aviv in a good time. The unstable weather allowed him to take a great series of photos. Guerra was in Israel as part of the "Aircraft Carrier" - The Israeli Pavilion at the Venice Biennale. 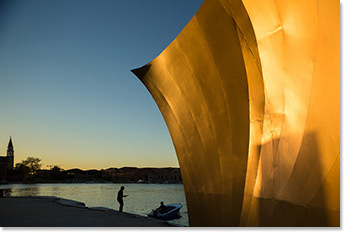 He toured the country and photographed Israeli projects he will exhibit in Venice. As part of his visit, he even shot the building where we are based. Mr. Guerra, try to make us look nice, will you?" A mais completa biblioteca online de imagens da arquitectura contemporânea portuguesa. Visite-nos regularmente para novas imagens. 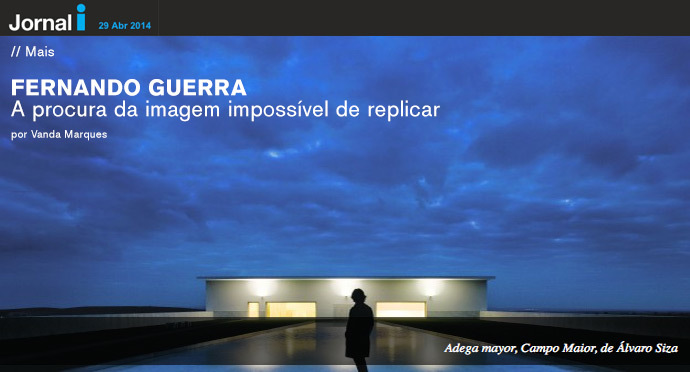 The most comprehensive online image library of contemporary portuguese architecture. International reference works. Special articles. Publications. 1. last 2. latest, most recent; Latest is the superlative of late. adj You use latest to describe something that is the most recent thing of its kind. 3 adj You can use latest to describe something that is very new and modern and is better than older things of a similar kind.